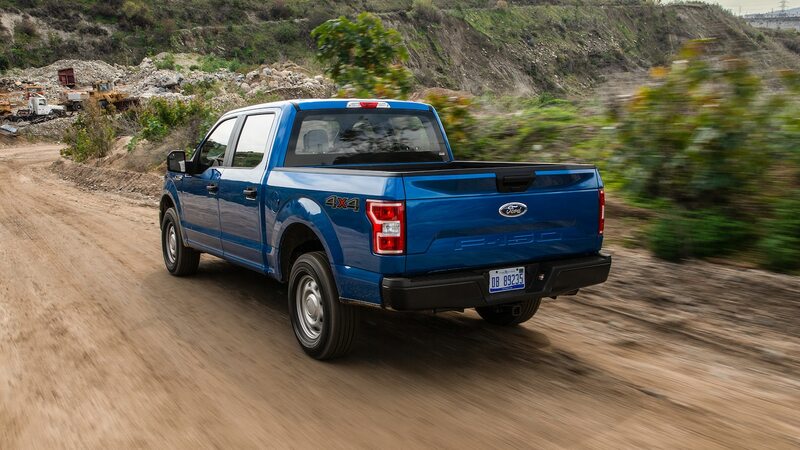 One of my first memories of a pickup truck was the Ford F-150 at my uncle’s ranch about an hour away from Mexico City. 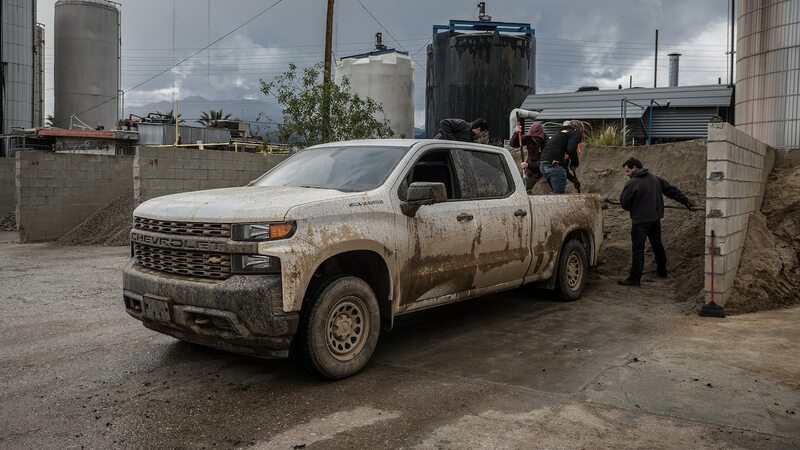 The white work truck from the late ’80s, with its funky red interior and single cab, was employed for many tasks at El Rincón—“The Corner” in English, aptly describing the ranch’s location in Tepeji del Rio. 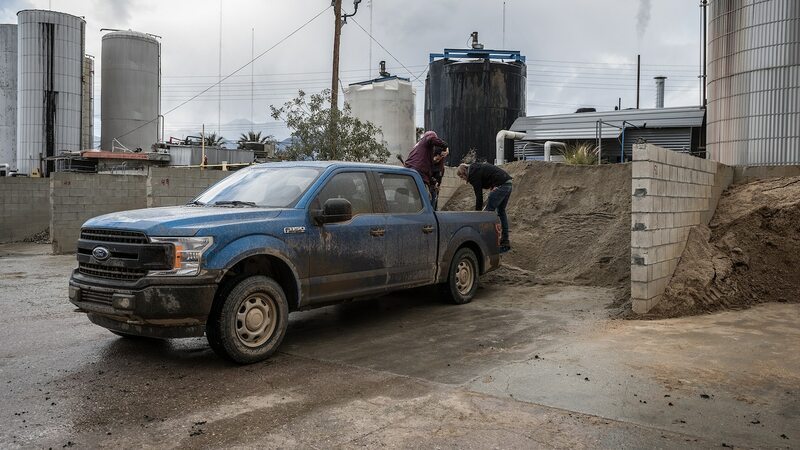 Driven only by Salvador—“Chava,” as we called the caretaker—the F-150 serves as a patrol car for the 27-acre property, hauling lawnmowers from one side to the other and bringing stacks of hay to the stables, among many other tasks. 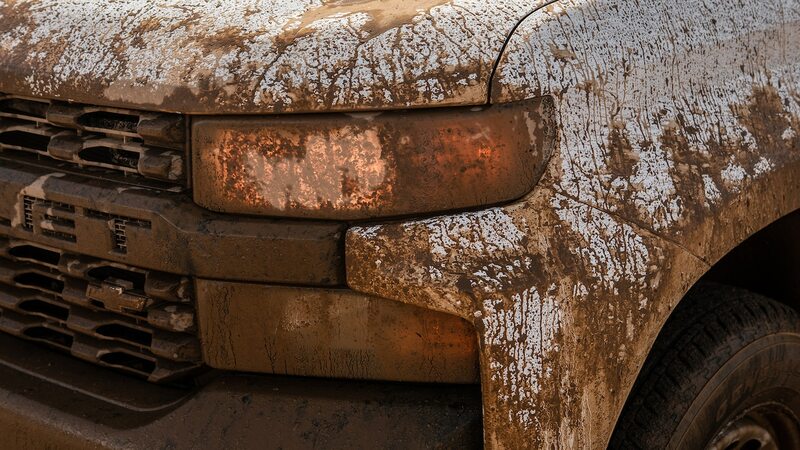 The truck rarely got any rest. 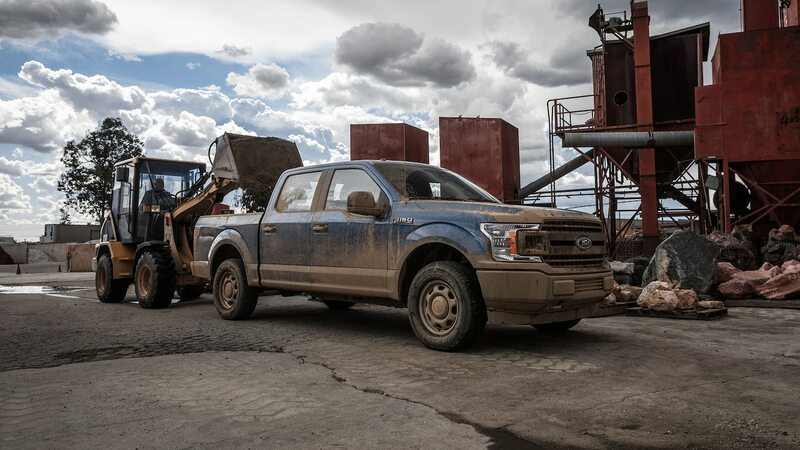 It was a real work truck—crank windows and manual side mirrors—and the F-150 served its purpose every day. 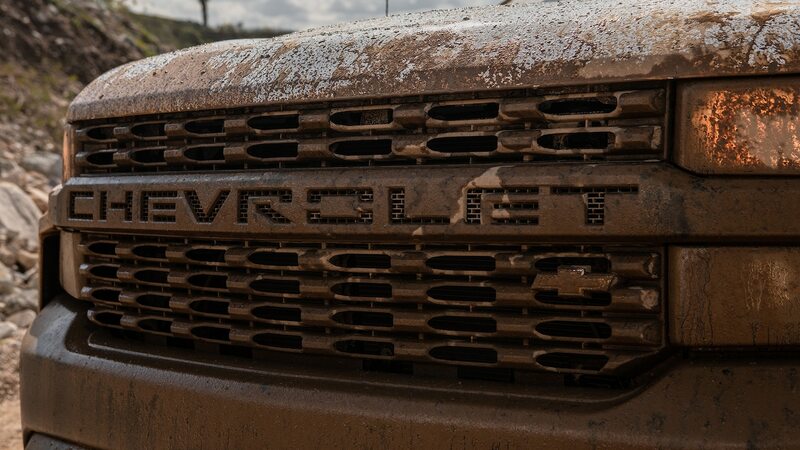 My uncle eventually sold the ranch in the early 2000s, but my interest in trucks didn’t stop. 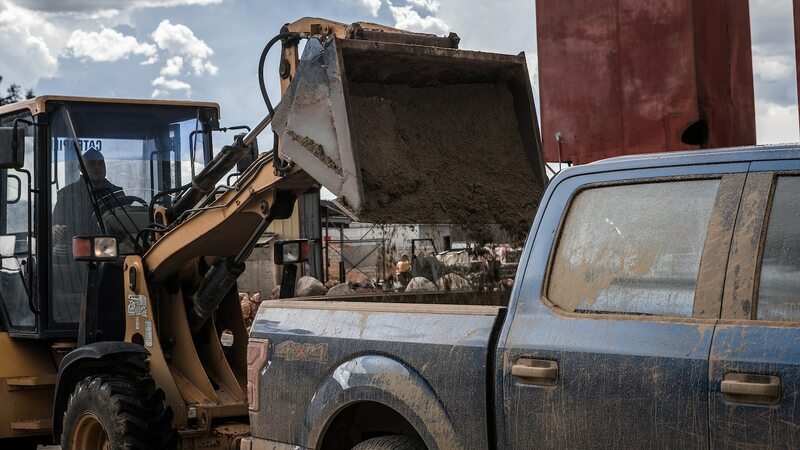 Later, when I moved to Texas as a teenager, I saw even bigger haulers, and my high school’s parking lot had a decent number of trucks from every American brand. 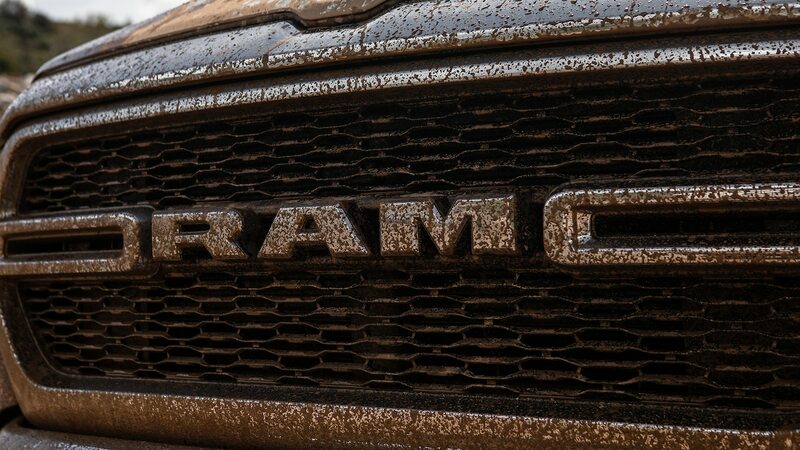 But something had changed. 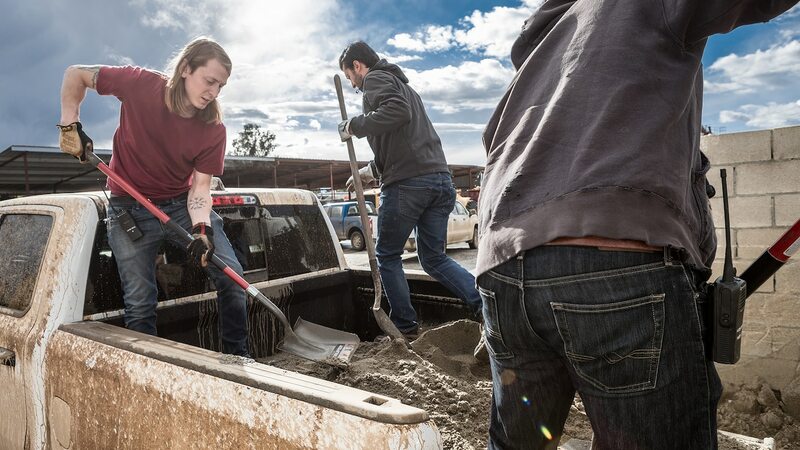 My friends weren’t getting trucks because of the service they provided—they got them because they liked riding high and enjoyed having a bed to haul their toys. 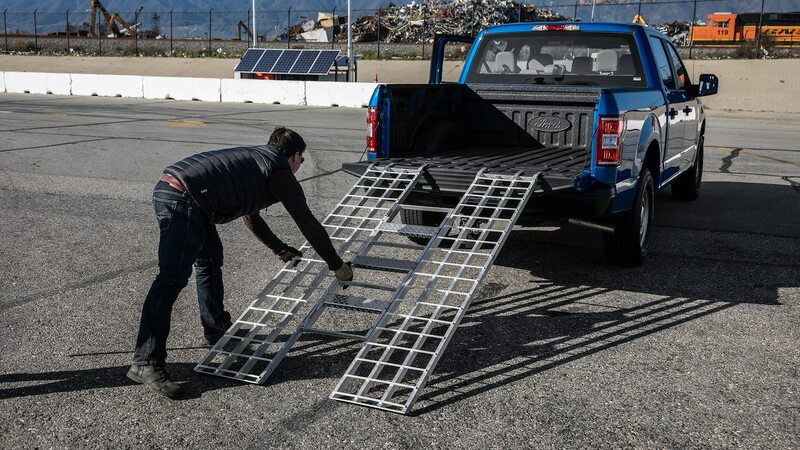 Lifestyle had taken over for utility. 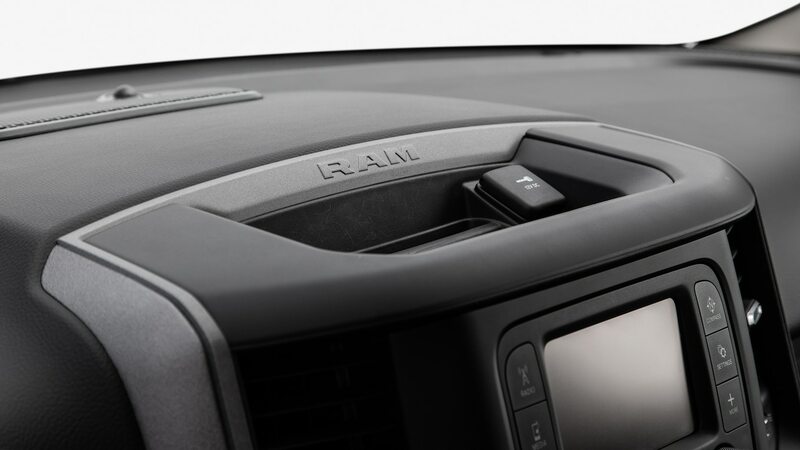 That trend has continued for the past decade and a half, as automakers equip their trucks with touchscreens bigger than an iPad, fancy sound systems, and 360-degree cameras. 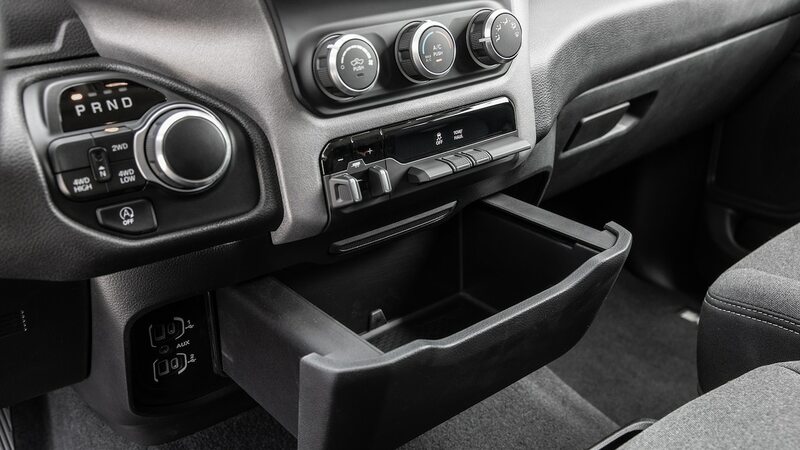 Long gone are the days of two-speaker stereos and utilitarian interiors, like Chava’s pure F-150. 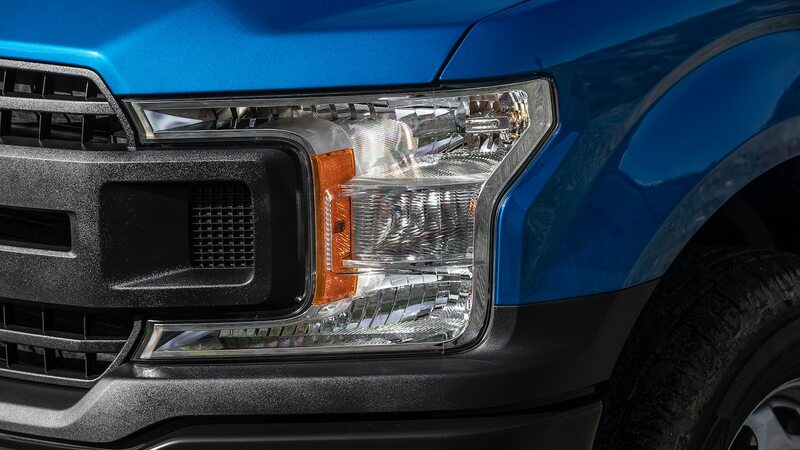 What does that mean for the American work trucks of today? 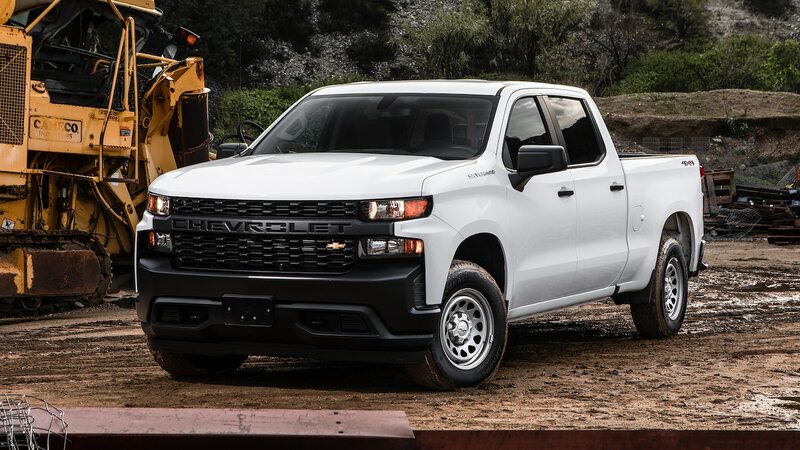 Have manufacturers compromised the rugged utility of their base-model trucks to appeal to suburbanites? 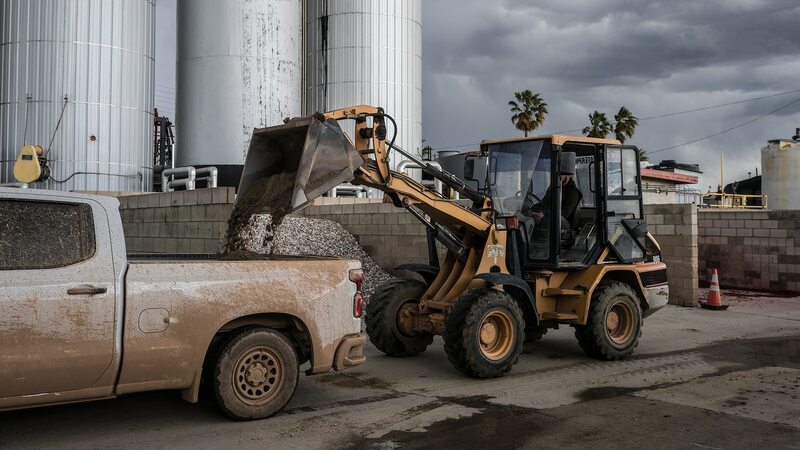 We decided to find out by testing the trucks the way most contractors, landscapers, fleet managers, and regular Joes would use them. 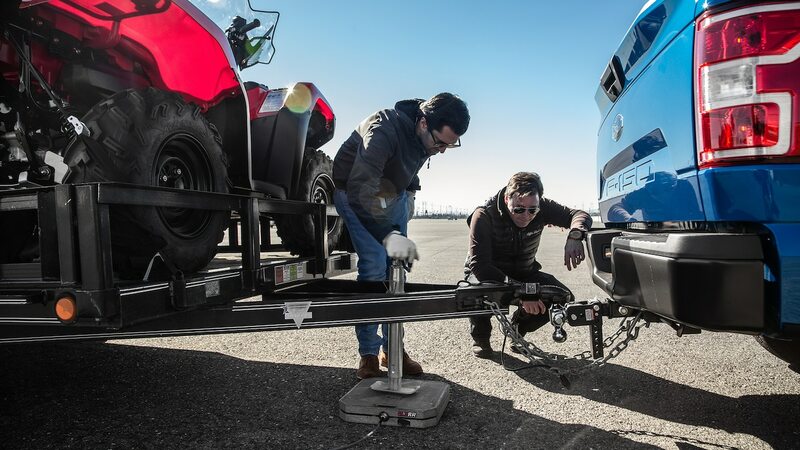 During a week of testing, we hauled, towed, and simulated runs to Home Depot. 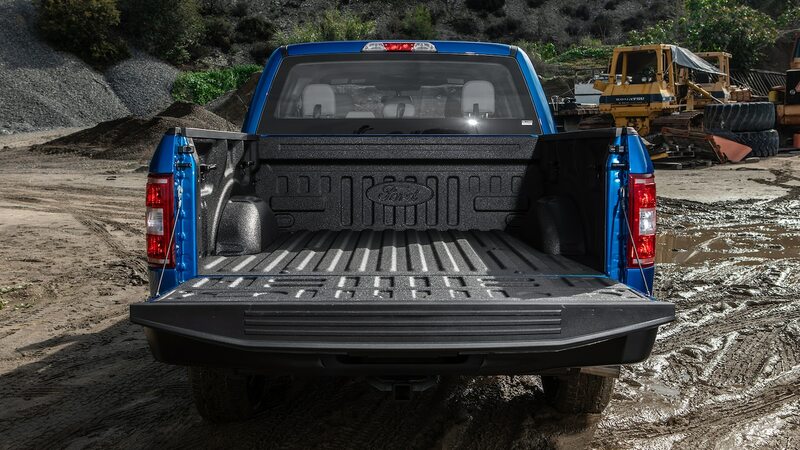 We spent time analyzing each truck’s bed, its access, and its handiness. 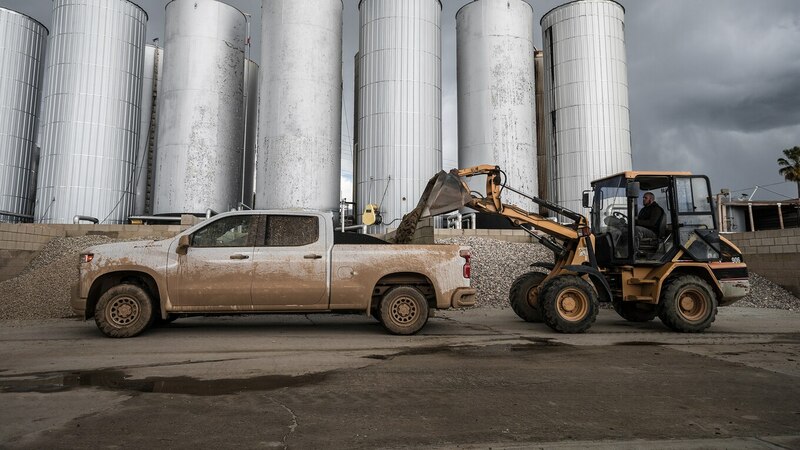 And our winner is simply the best work truck, the one that best fulfills its core purpose. 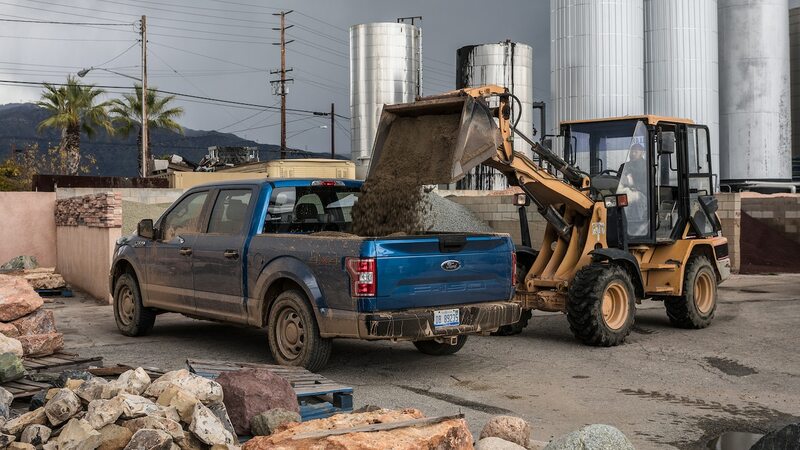 We asked each manufacturer to send us its half-ton truck with a base engine, 4×4 setup, and crew cab. 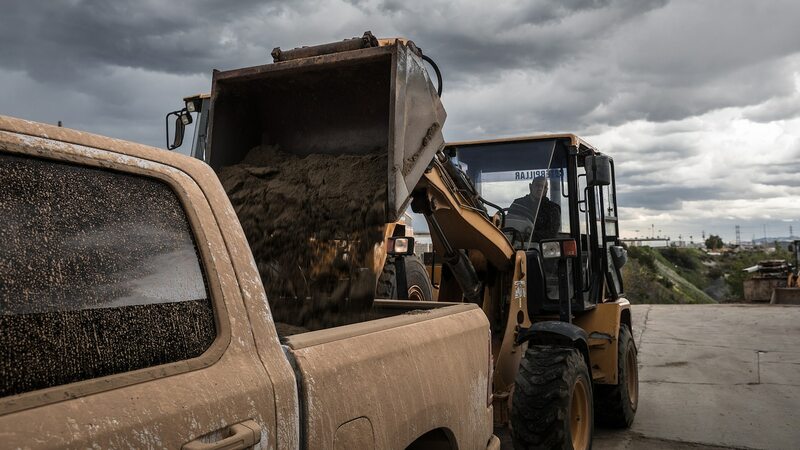 Most contractors and fleet managers are not willing to pay for the upgrade to the next available engine, but having traction at all four wheels along with a crew cab is essential for those who work in the construction business. 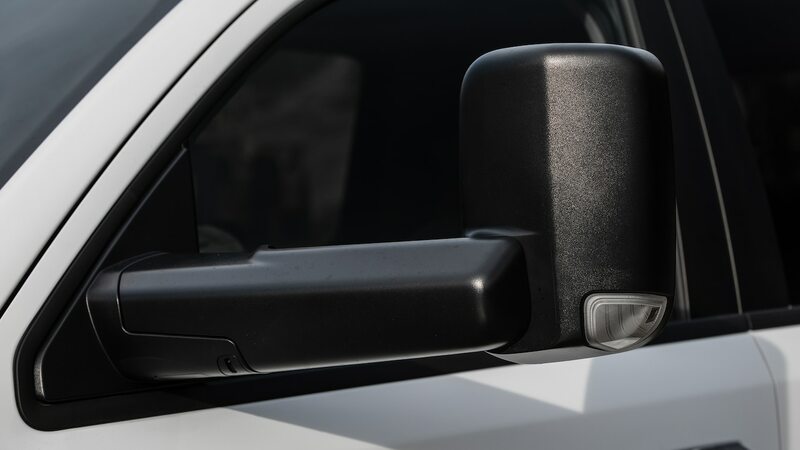 We gave each brand the choice to equip its truck with about $2,000 USD worth of options to keep prices in the $42,000 USD range. 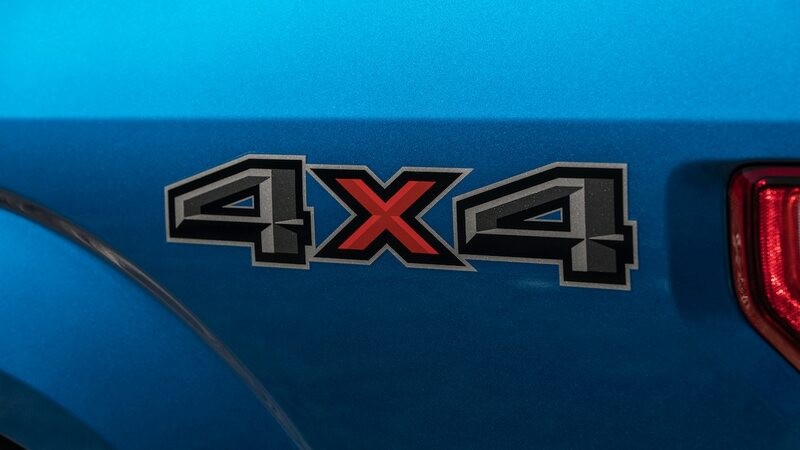 Unfortunately, only one was able to stick to our request. 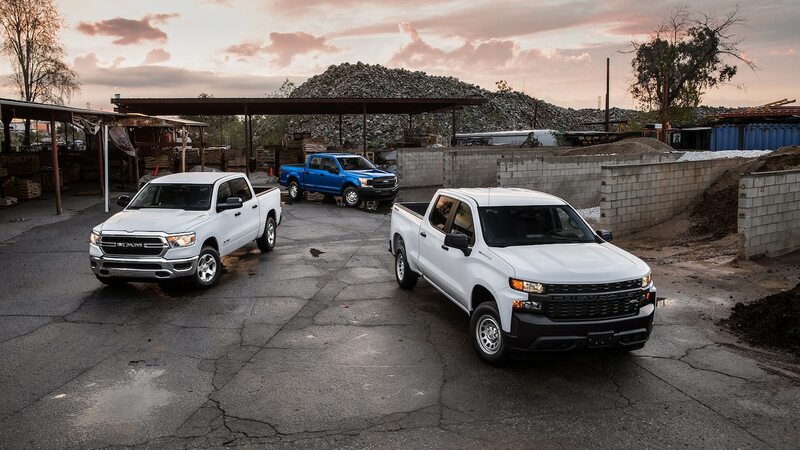 That’s the full-size truck market for you. 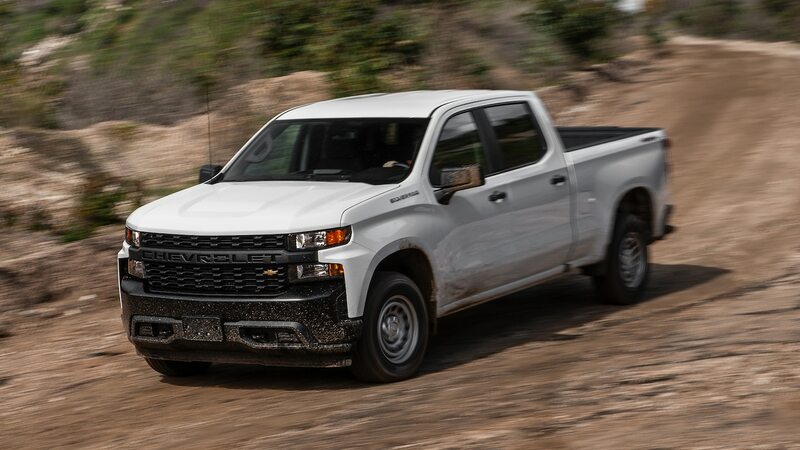 The 2019 Chevrolet Silverado WT was the only truck that showed up without a spray-in bedliner but with a 6-foot-6 bed, a $300 USD surplus over the 5-foot-8 box. 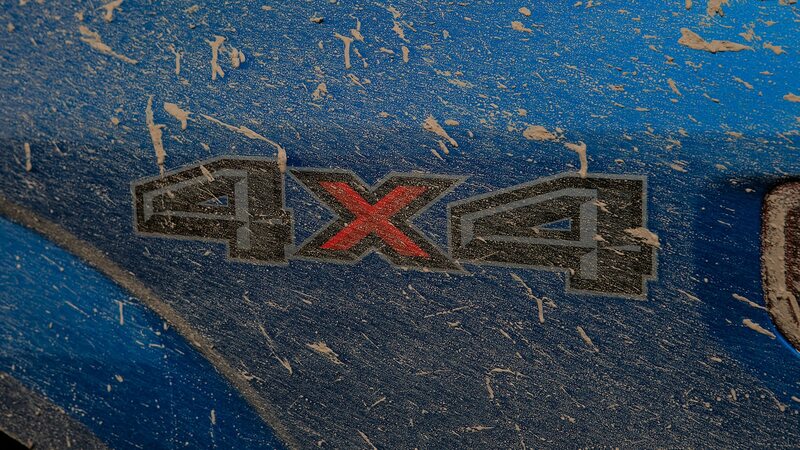 It was also the sole pickup that lacked proper 4×4 traction—only supporting four high but not four low. 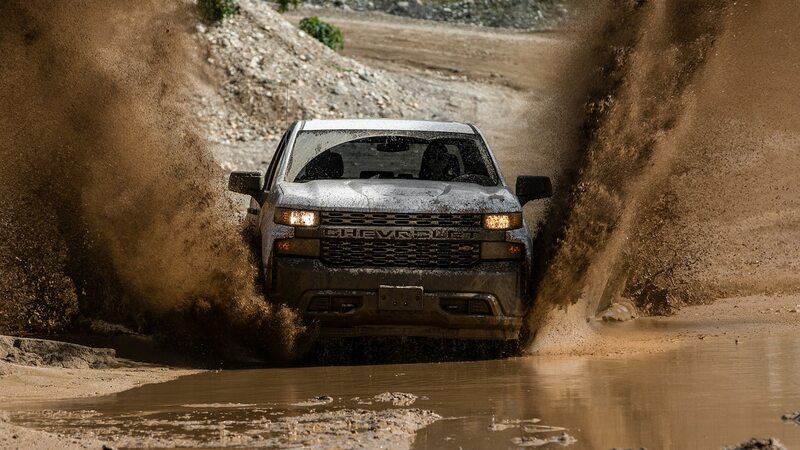 Propelled by a 4.3-liter V-6 mated to a six-speed automatic, the Silverado WT produces 285 hp and 305 lb-ft of torque. 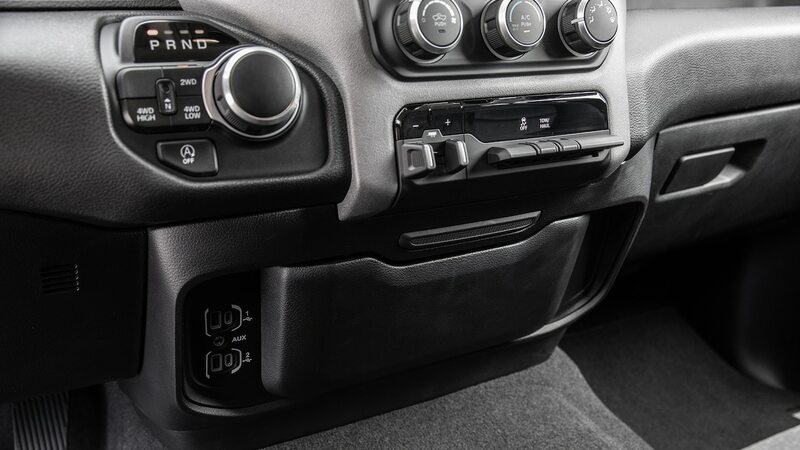 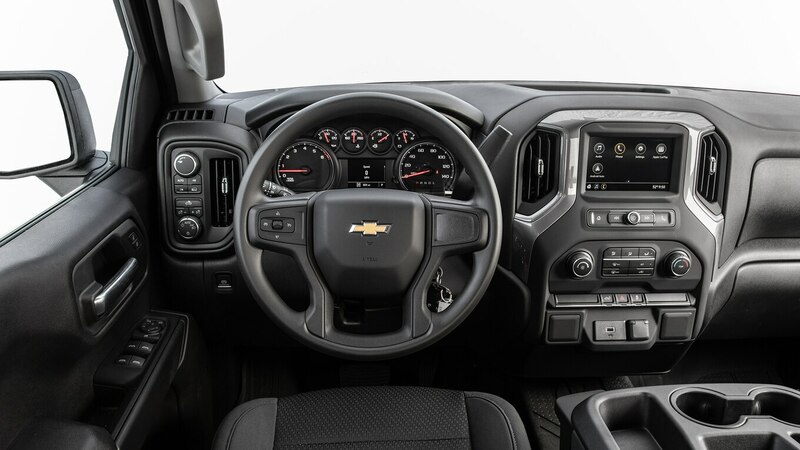 Its cloth-seated interior is simplistic, but Apple CarPlay and Android Auto come standard through a 7.0-inch touchscreen, reminding us that even in today’s work trucks, technology is omnipresent. 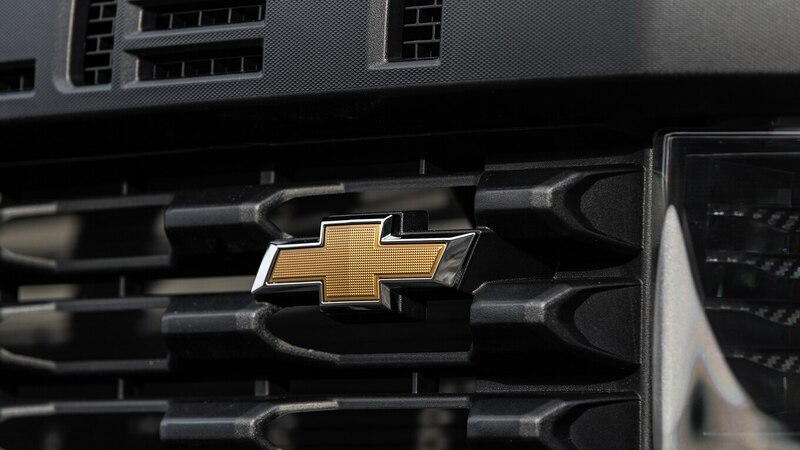 But Chevy also was the only manufacturer that complied with our price request, checking out at $41,115 USD. 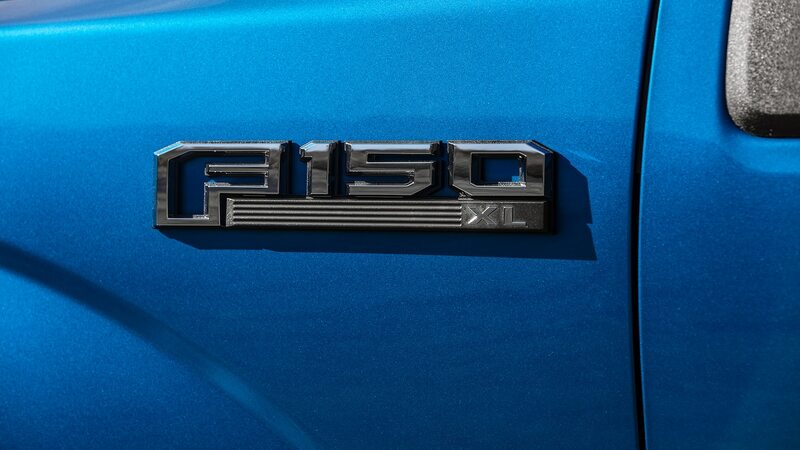 The Ford F-150 XL is familiar to us. 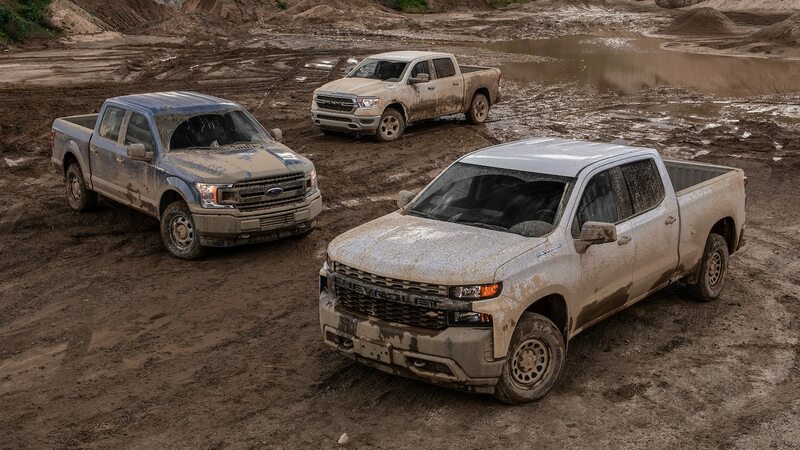 We praised it during our 2018 Truck of the Year program, where the entire model line took top honors. 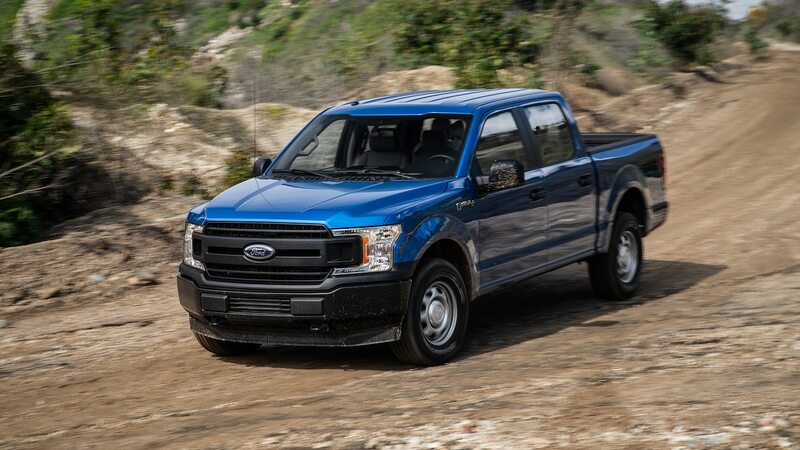 But just a year later Ford is facing stiff competition from its American rivals (and remember, we’re just testing the base model here). 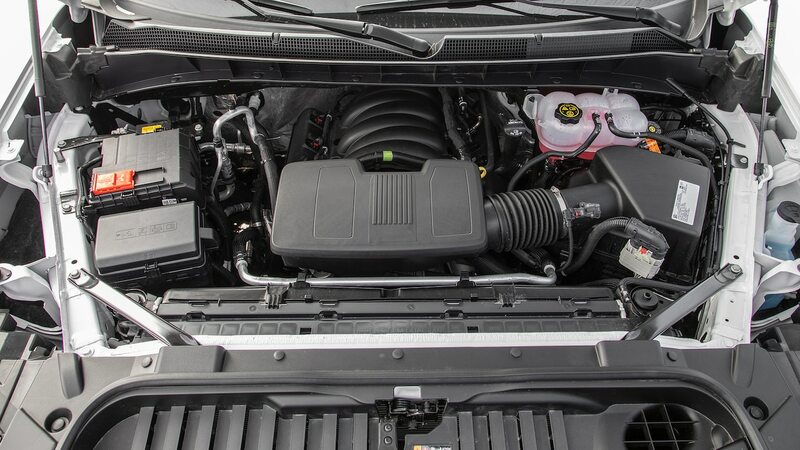 Its 3.3-liter V-6 delivers 290 hp and 265 lb-ft of torque and comes married to a six-speed automatic. 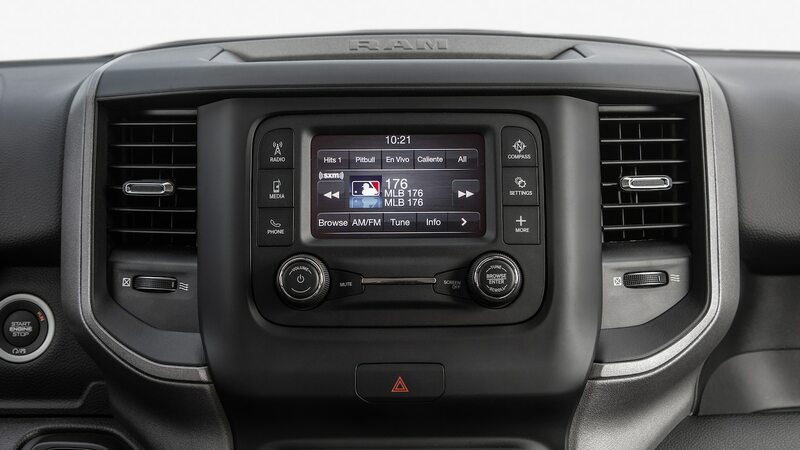 In true work truck fashion, it was the only player that showed up with a vinyl interior and no touchscreen. 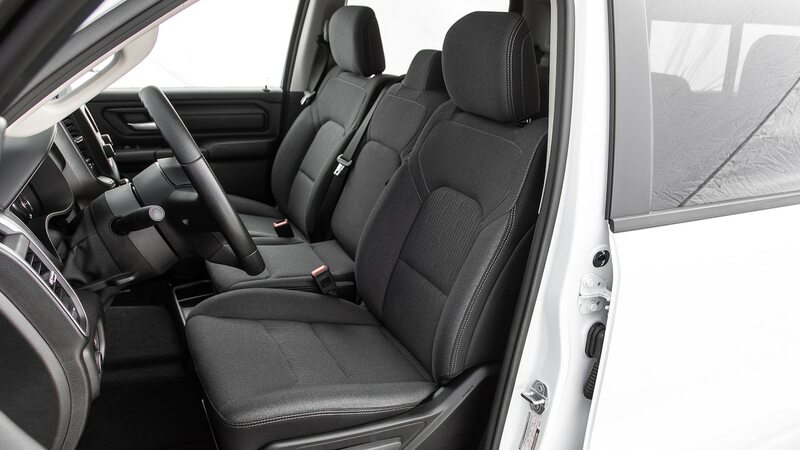 Its seats were the most comfortable, offering good cushioning for long days on the road or getting home from the job site. 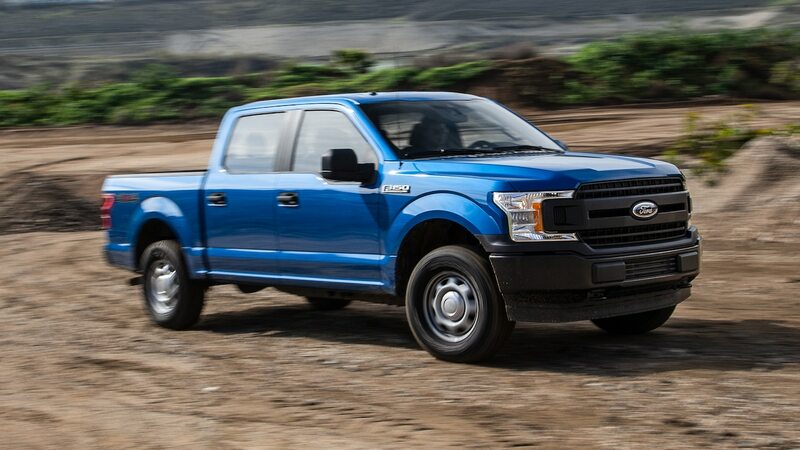 With a price tag of $43,250 USD, the F-150 fell in the middle of the pack in terms of price. 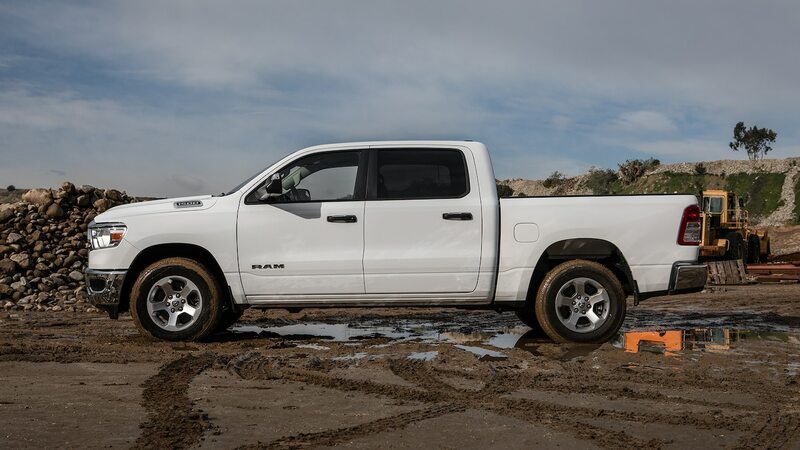 The Ram 1500 Tradesman’s mild hybrid technology is fancy from a work truck perspective. 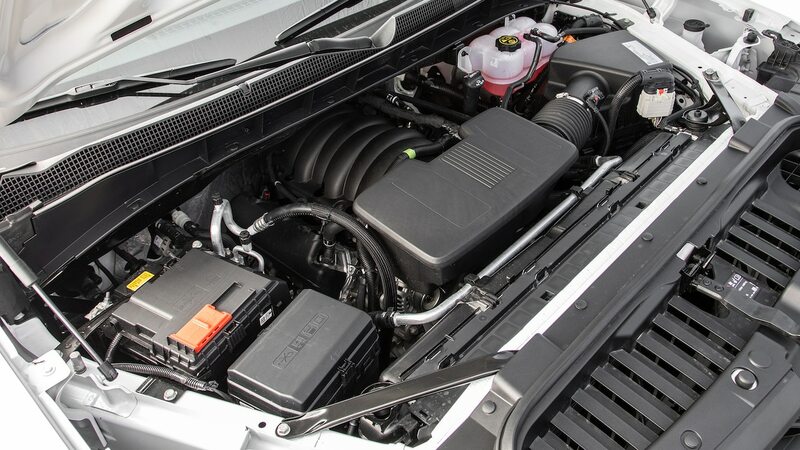 The 3.6-liter V-6 uses a small starter-generator and a 0.53-kW-hr battery to assist the stop/start system and provide torque help. 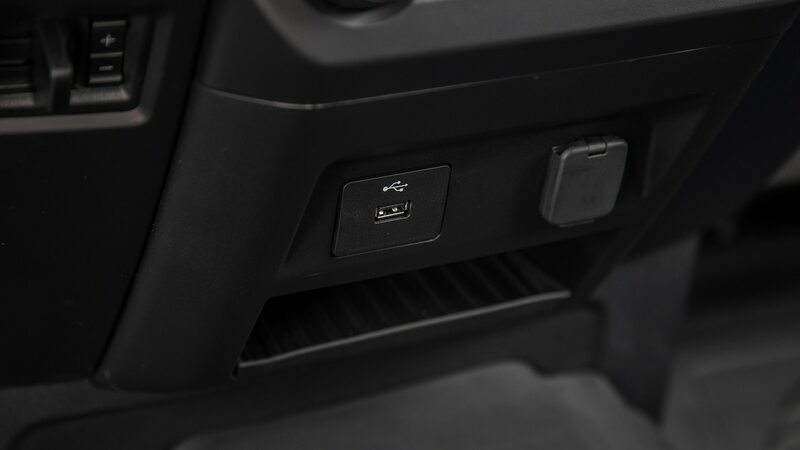 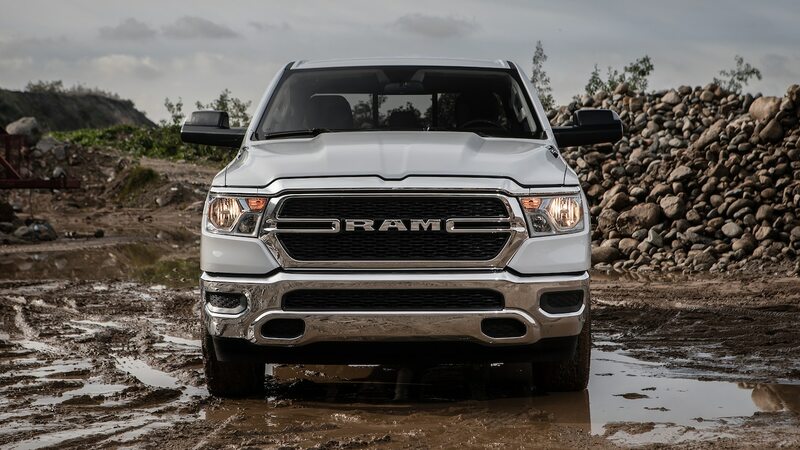 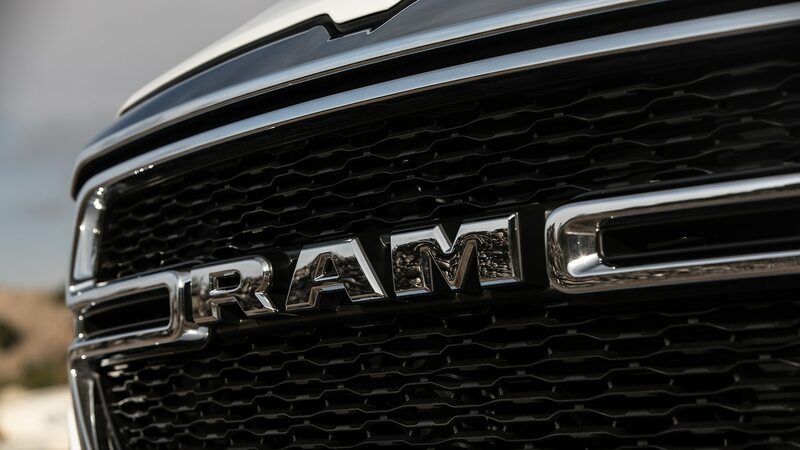 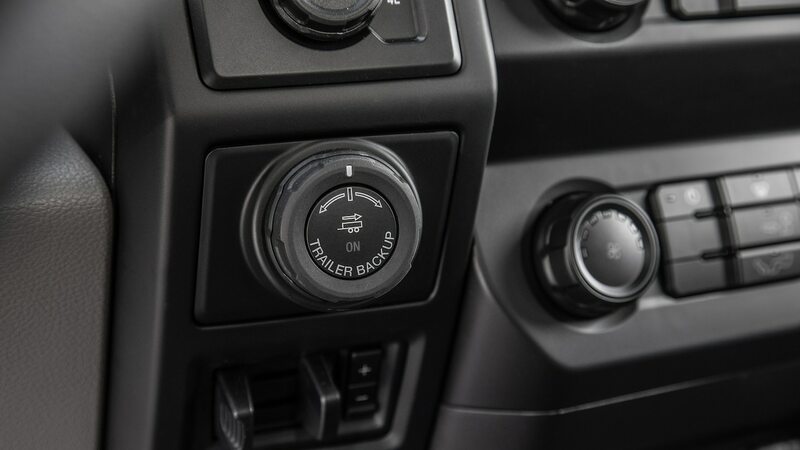 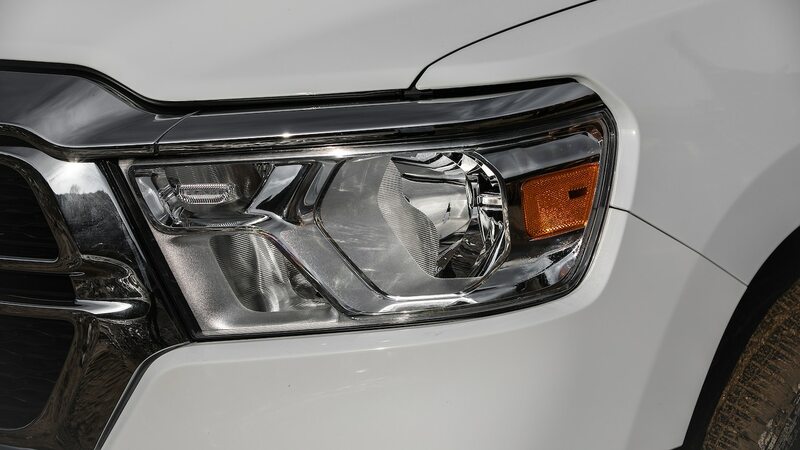 This tech is standard on every Ram 1500 equipped with the 3.6-liter engine, which is paired to an eight-speed automatic and produces 305 hp and 269 lb-ft of torque. 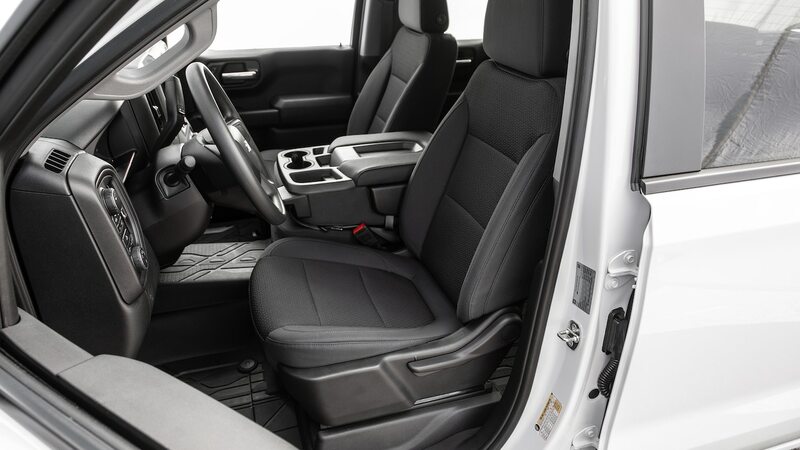 The Ram lineup’s interior wowed us during the 2019 Truck of the Year competition—which Ram won—and even the base model shows fine attention to detail. 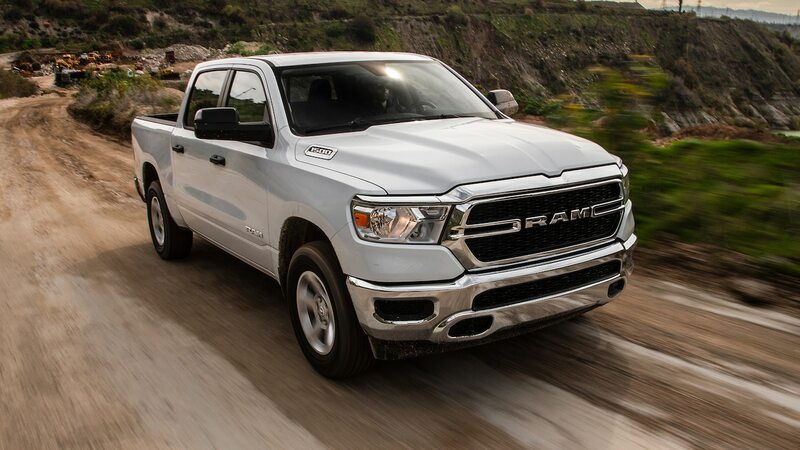 Adorned with a chrome appearance package, 18-inch alloy wheels, floormats, and a push-button start, the Ram 1500 looked the most premium of the field (even with cloth seats). 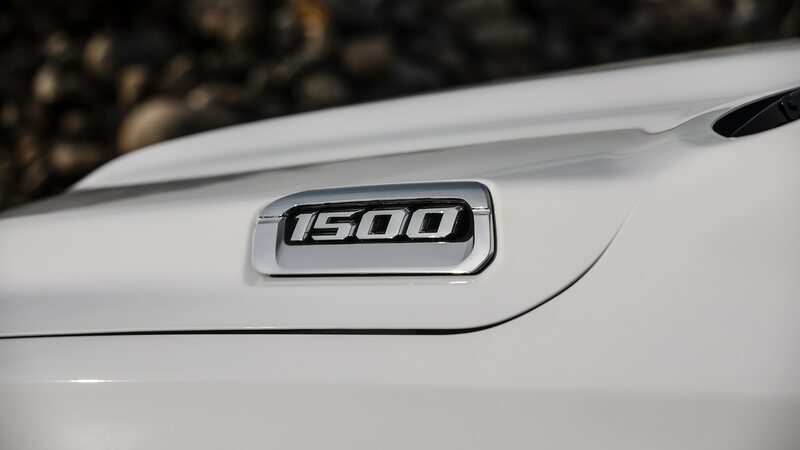 However, the chrome package added $995 USD to its already hefty $44,275 USD price. 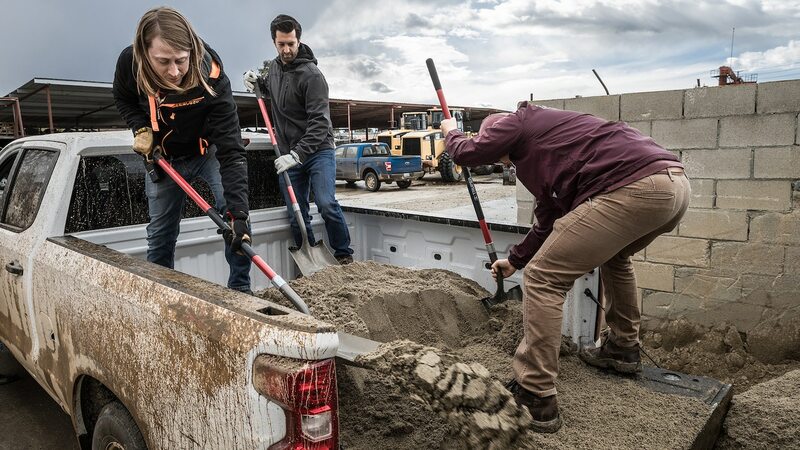 With this field of trucks, it was time for us to roll up our sleeves, put on our gloves, and start the engines. 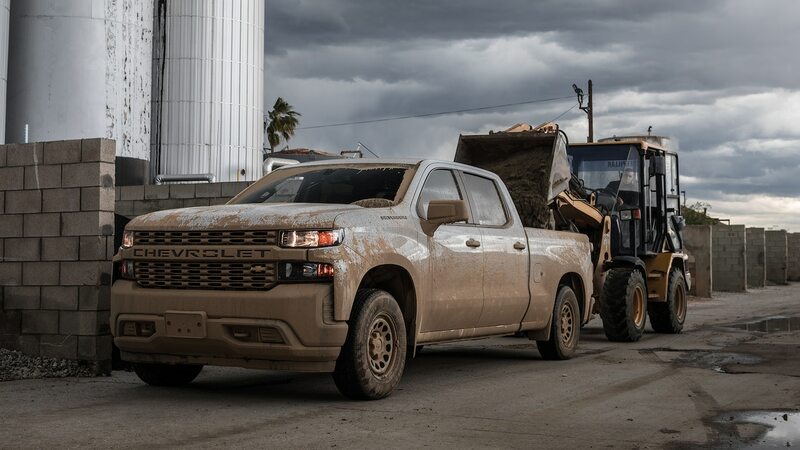 What the Silverado lacked inside, it gained with its bed. 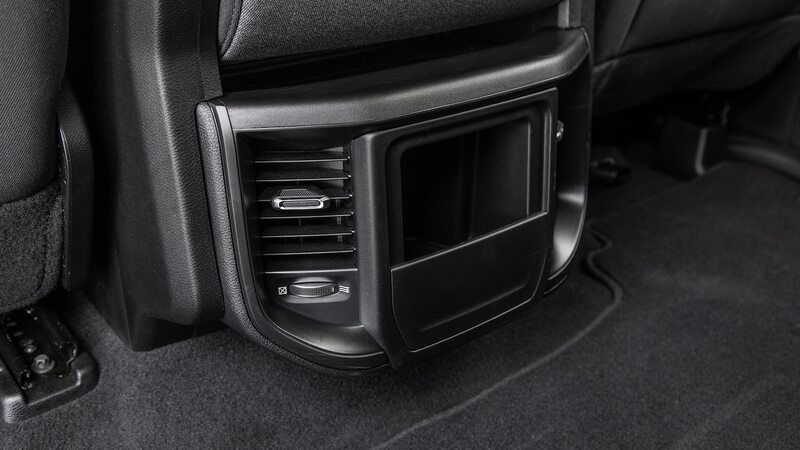 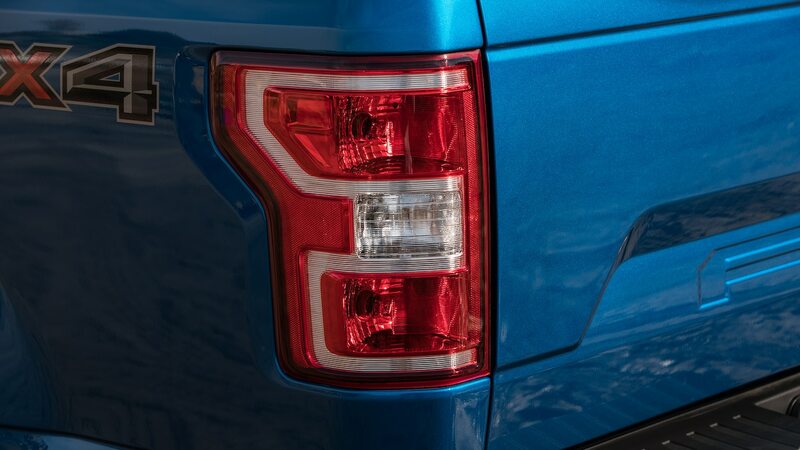 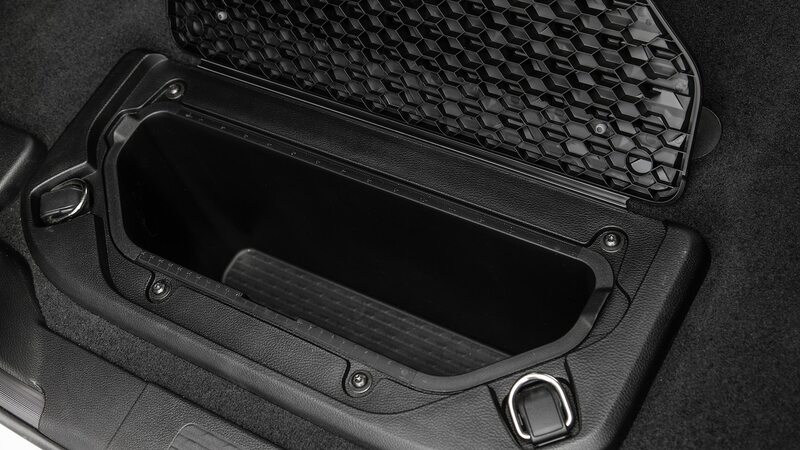 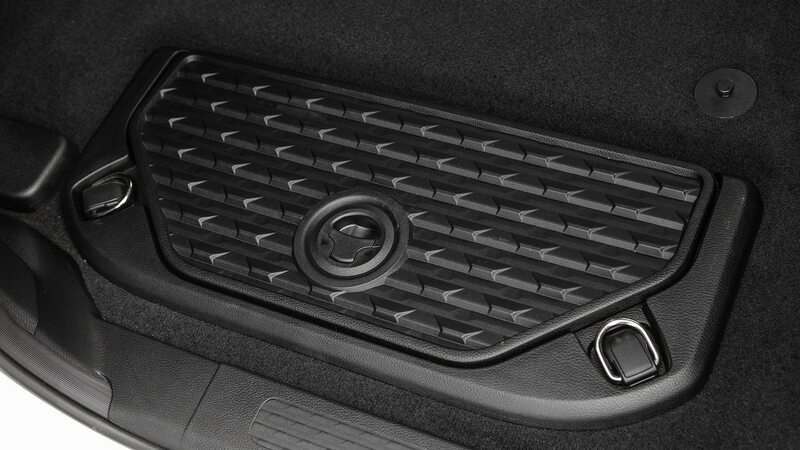 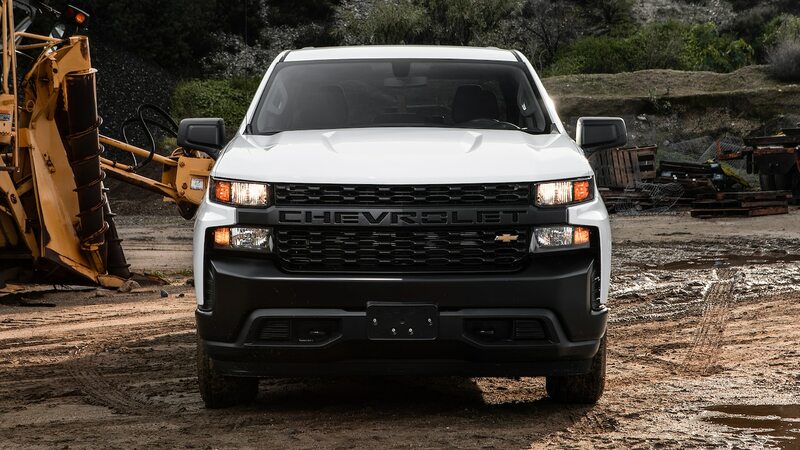 With 12 standard hooks, standard CornerSteps to ease entry into the bed, and a standard power and damped tailgate, Chevy thought of every detail. 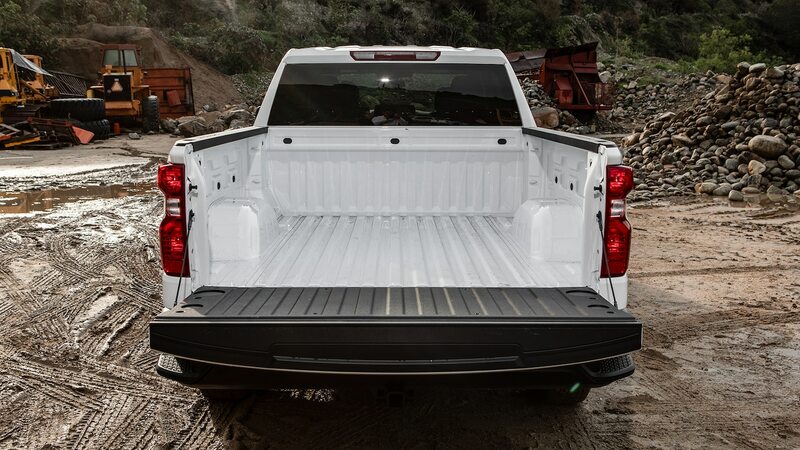 With its $300 USD optional long bed, the Silverado also carries more. 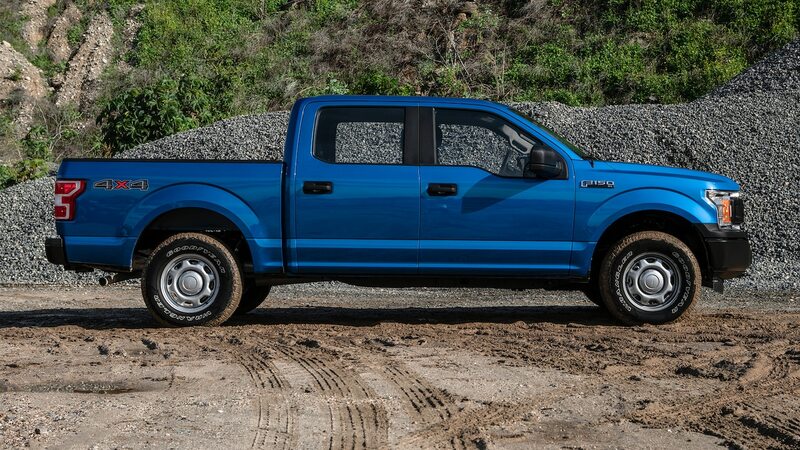 Ford and Ram also offer a large box, but Ford forces an engine upgrade. 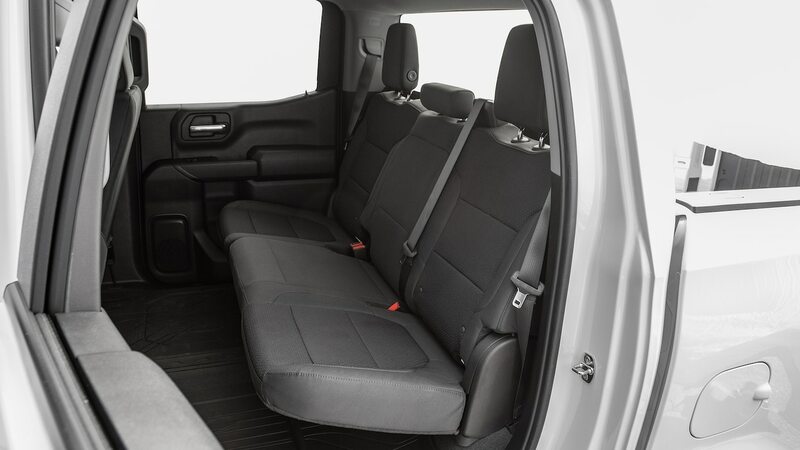 Unlike the Chevy, the beds of the F-150 and Ram came with just four tie-down hooks—one on each corner—but those trucks had optional adjustable tie-down hooks. 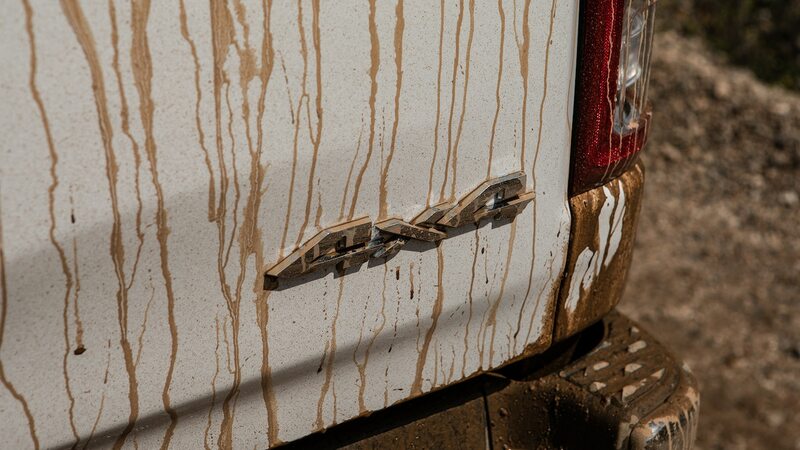 We didn’t miss the Silverado’s bonus hooks when we strapped ATVs to the beds, but Scott pointed out it was easier to access the Silverado’s midlevel hook than reaching all the way to the floor of the bed of the Ford and Ram. 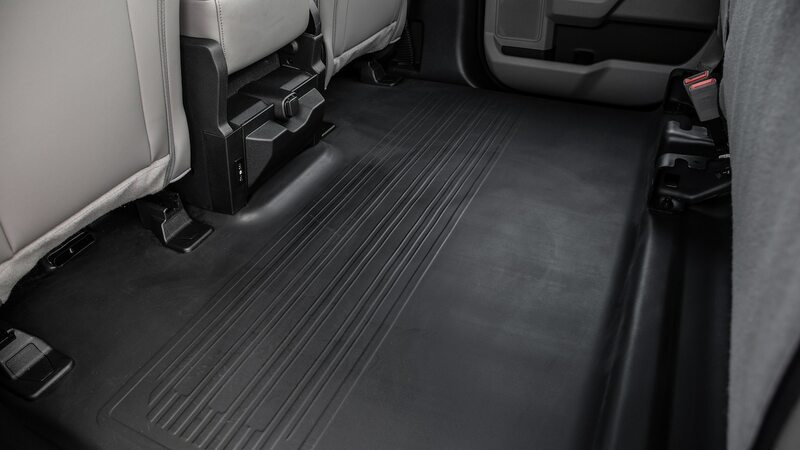 We recommend giving your Chevy dealer another $545 USD for a spray-in bedliner, as the Silverado’s bed suffered scrapes when we strapped down the ATV. 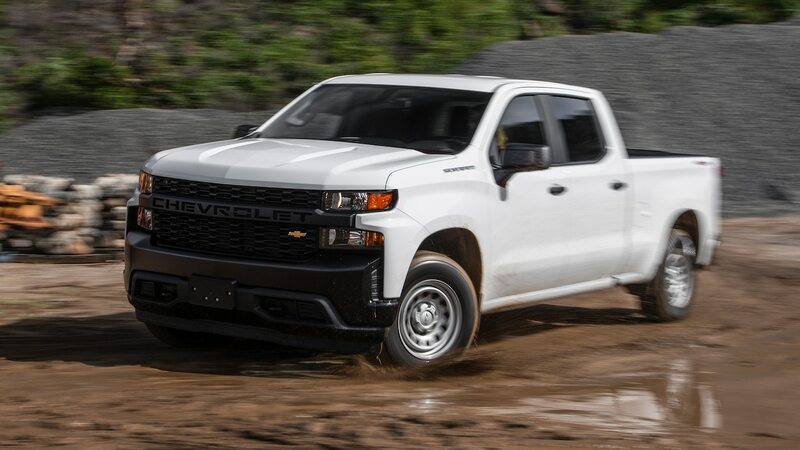 With the bed empty, the Silverado’s powertrain showed its gutsy nature. 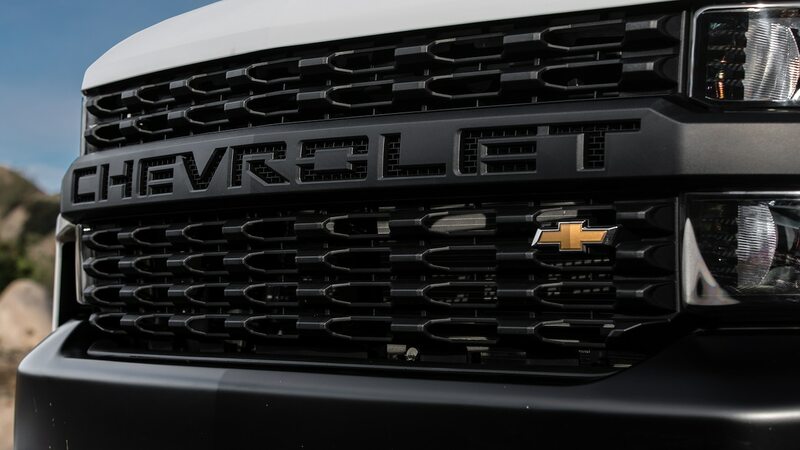 “It’s got a ton of low-end torque, and the transmission is not at all shy about downshifting for even more power,” Scott said. 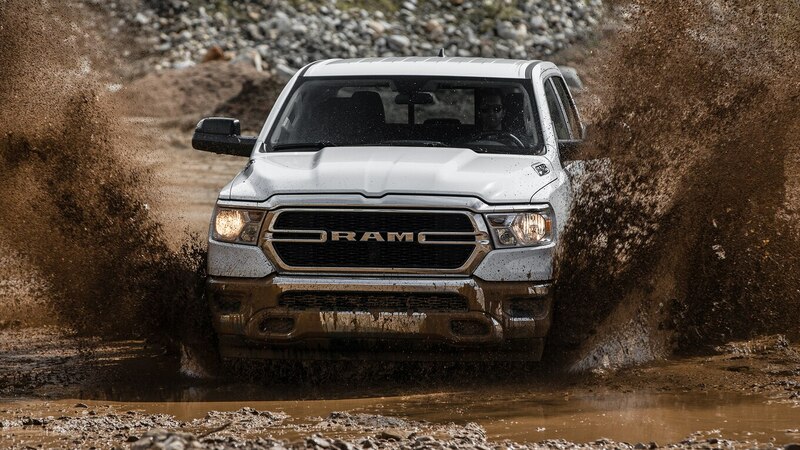 “It feels strong and ready for anything. 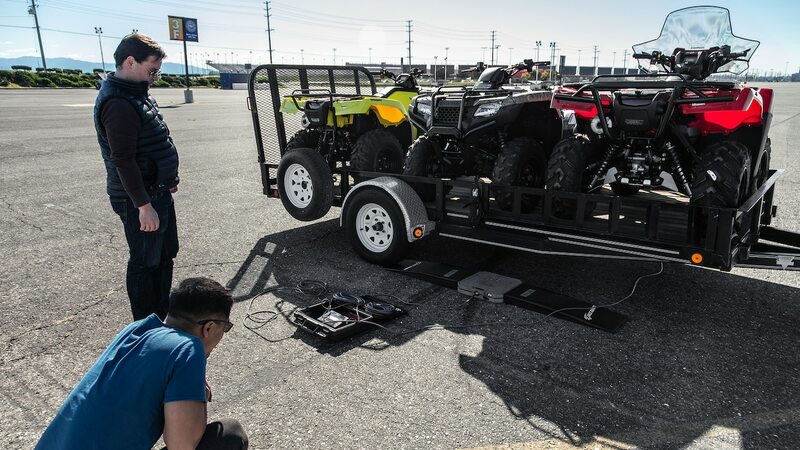 The transmission is smart and smooth.” When we strapped a 772-pound (350-kg) Honda Rubicon ATV into its bed, the engine didn’t seem to notice, though it was intrusively loud. 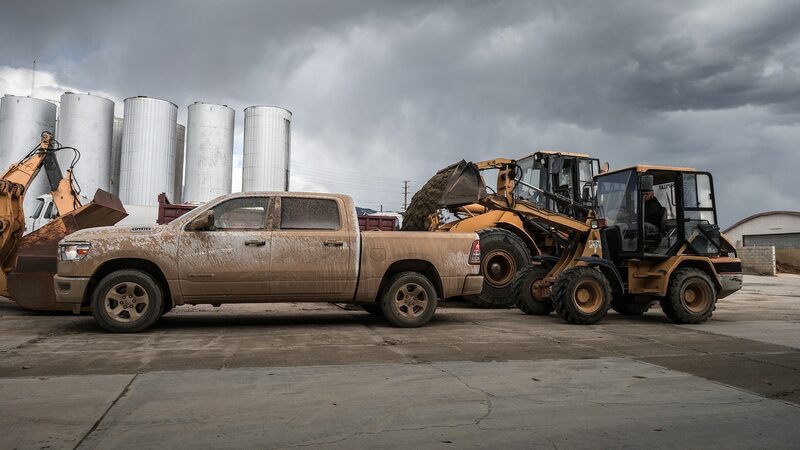 “Tow/Haul mode really evens out the Silverado and makes it actually feel like the fastest truck here,” Christian said, despite it tying with the Ram while hauling. 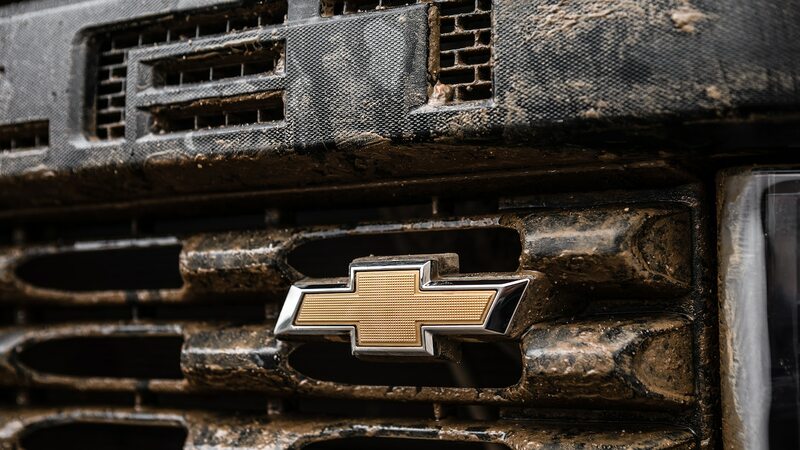 The Chevy’s ride was pretty comfortable, too. 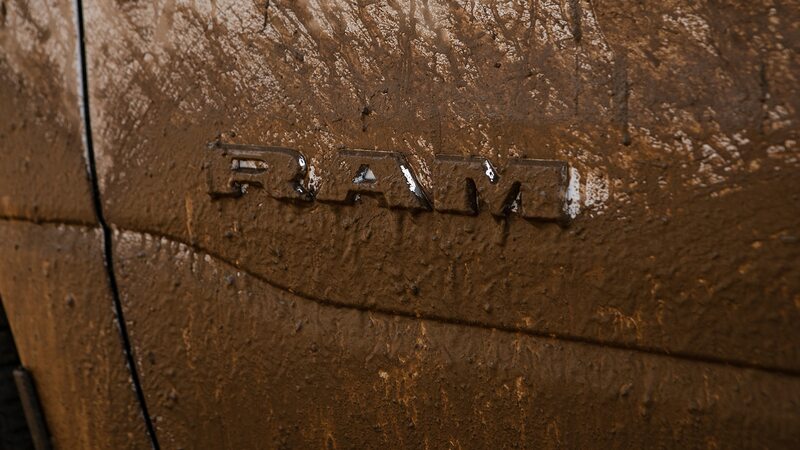 The Ram, on the other hand, had the best ride with the bed empty. 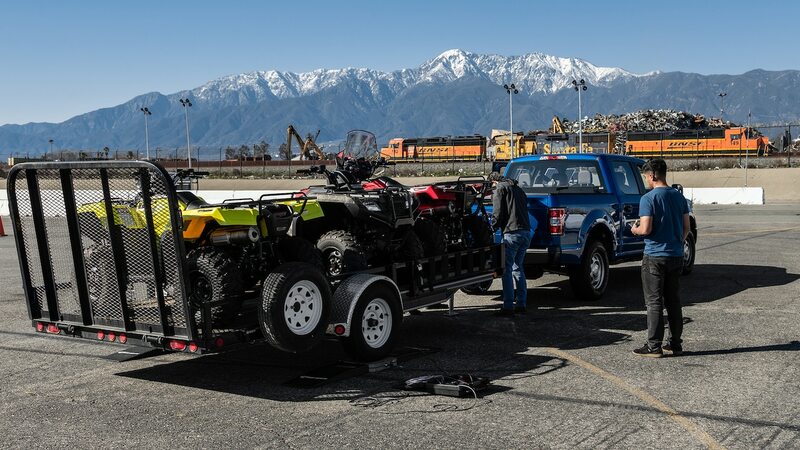 Its powertrain felt smooth, quiet, and refined, but when hauling a 600-pound (272-kg) Honda Rancher ATV, its ride suffered a bit, and it felt a little laggy. 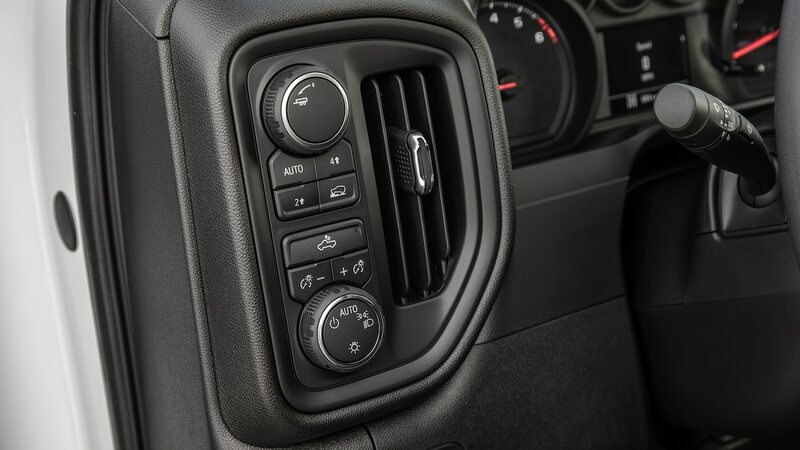 In Tow/Haul mode, the transmission keeps at least a gear lower than it would rather be, delivering more torque when necessary. 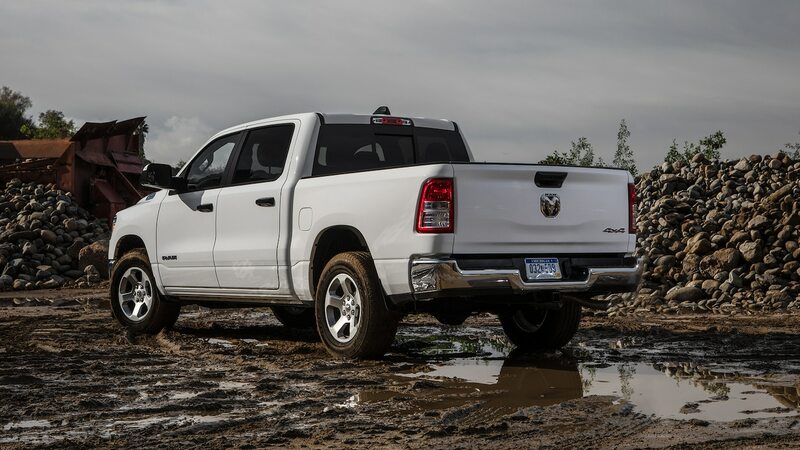 But even if you forget to press the Tow/Haul button, the Ram’s performance didn’t feel compromised. 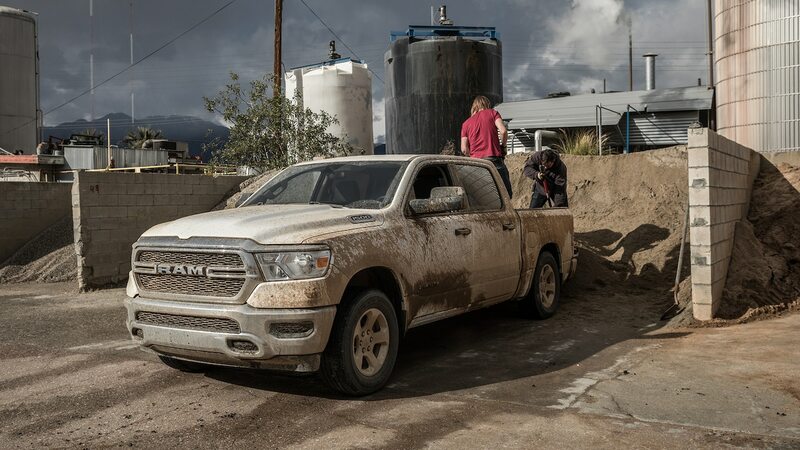 Whether we drove with payload or the bed empty, the Ram’s transmission was the only one that downshifted when going downhill, holding a steady speed and hardly requiring us to touch the brakes. 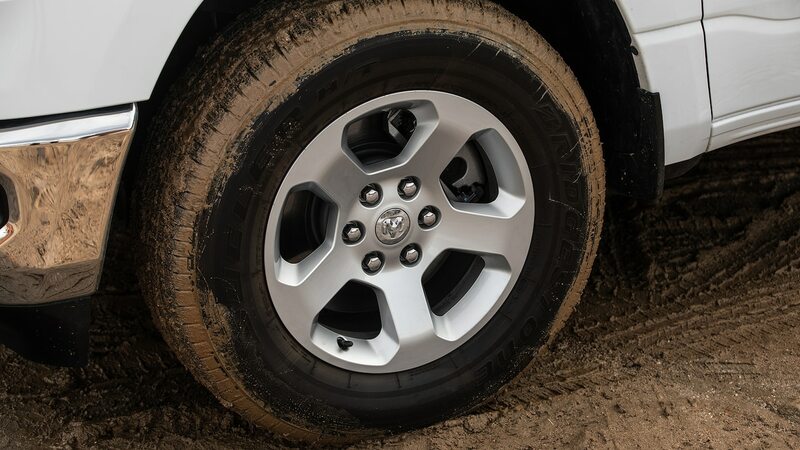 As we’ve underlined in past comparisons, the Ram’s coil spring rear suspension makes for a refined ride. 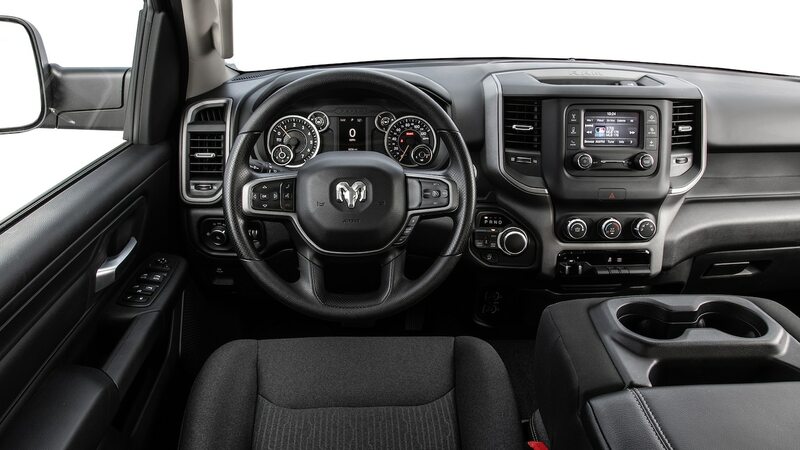 Among these three base trucks, that makes a big difference inside the cabin, where everything seems quiet and peaceful in the Ram. 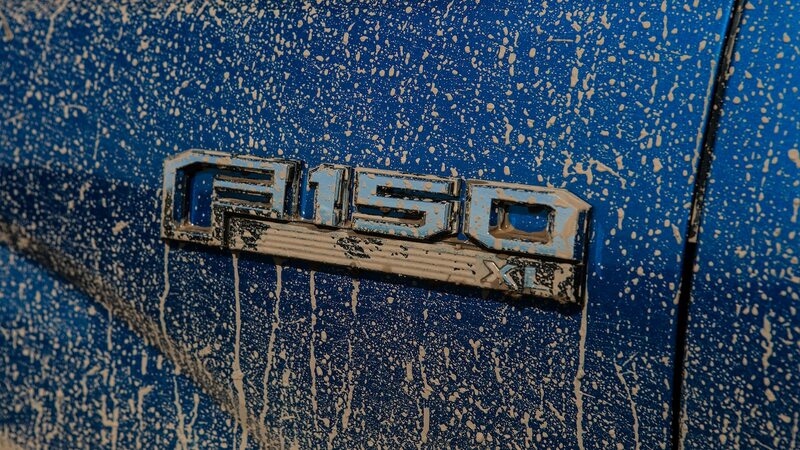 For someone who’s been cutting 2x4s all day, it’s a welcome respite on the way home. 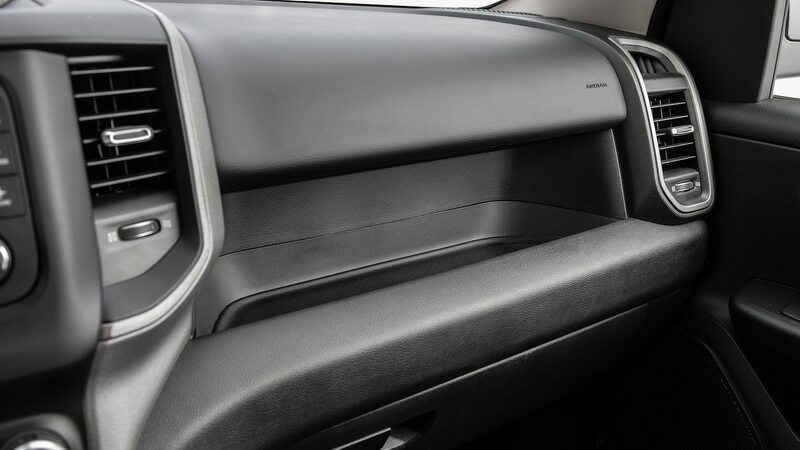 Even on its base trim, the Ram’s interior felt upscale. 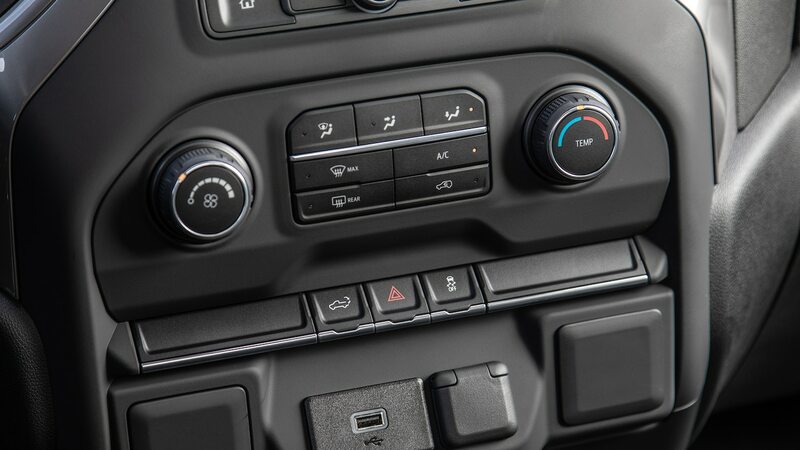 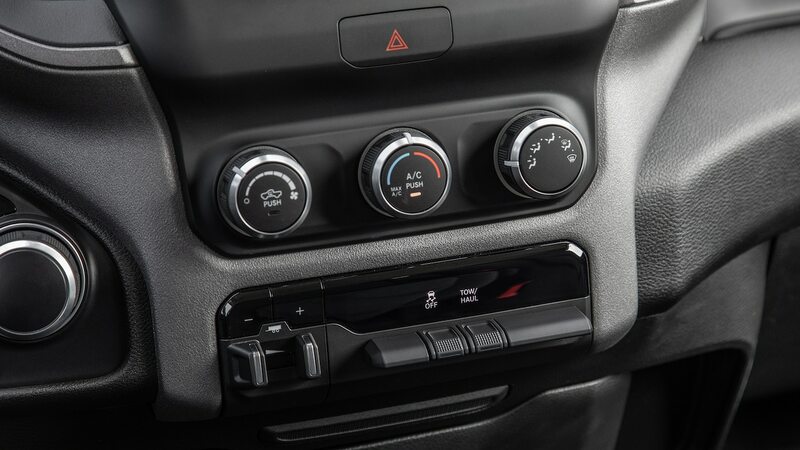 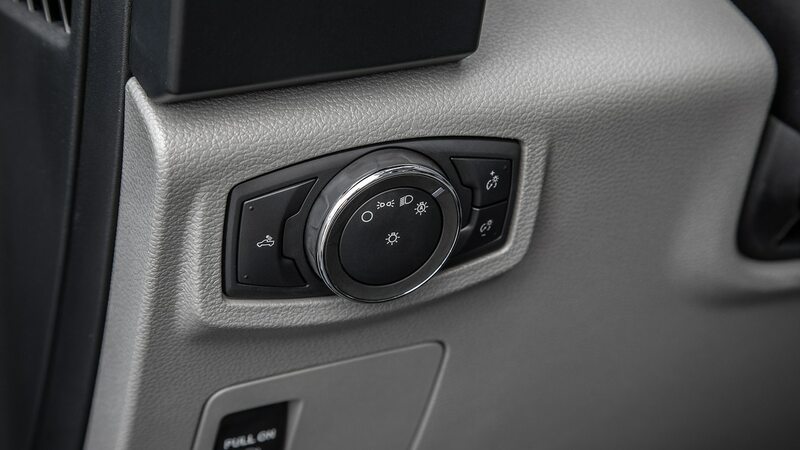 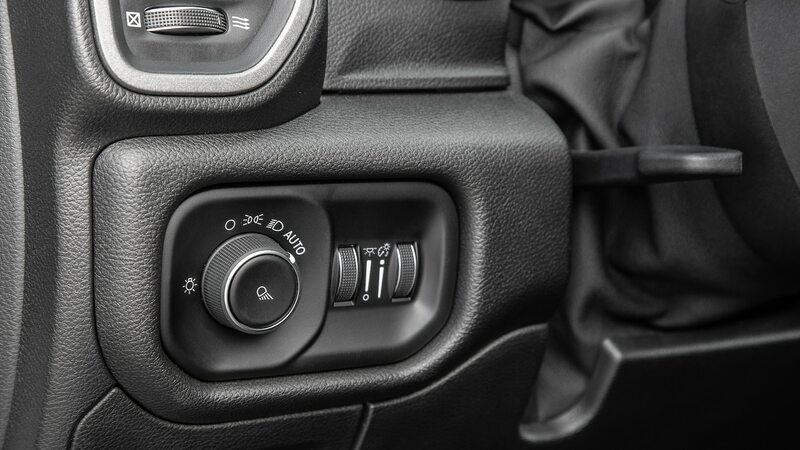 Its rotary shift knob feels fancy for a work truck (in a good way), and its 5.0-inch capacitive touchscreen is colorful with good resolution. 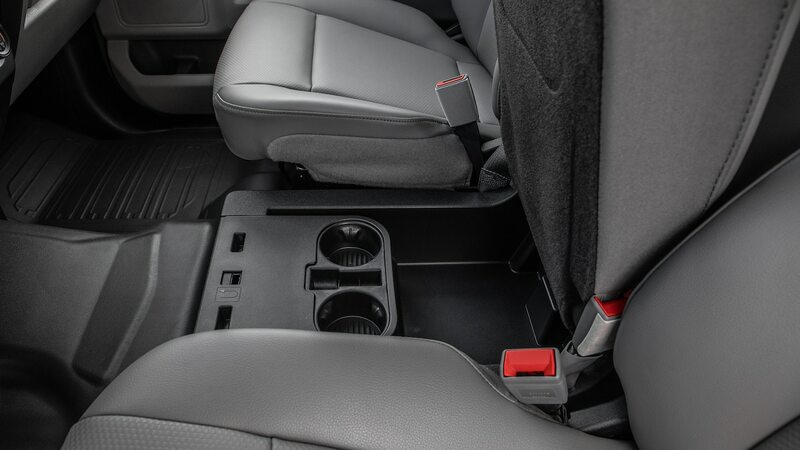 When the middle seat of the front bench is flipped down, you can access a center compartment—and if you reach under the seat you’ll find a hidden compartment. 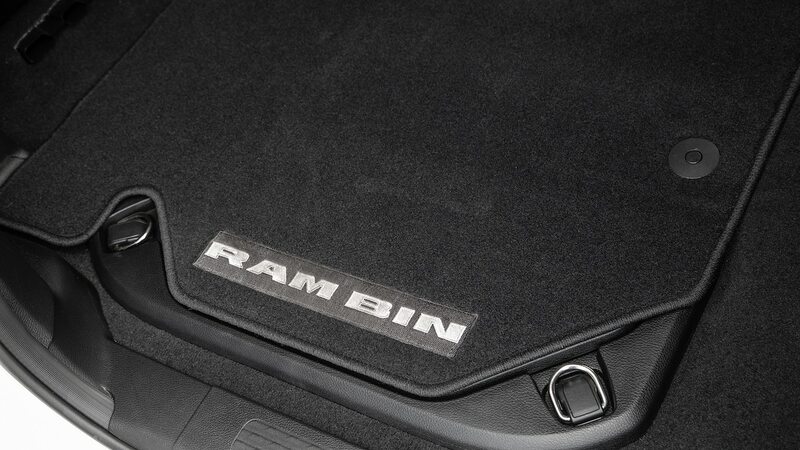 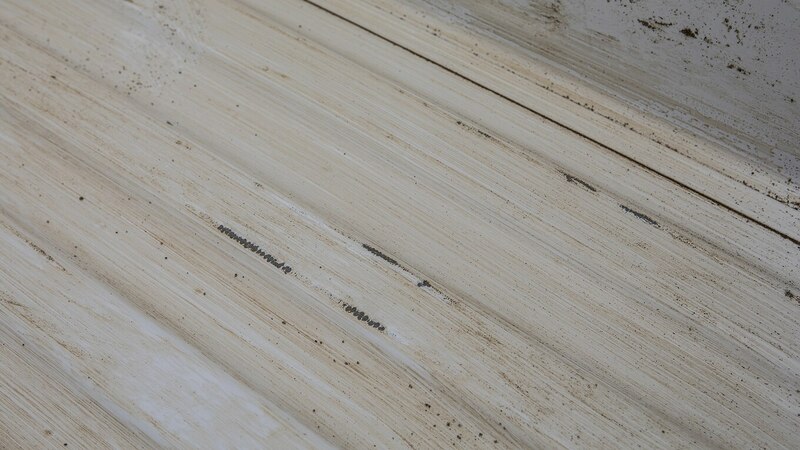 Enter the second row, and you’ll have access to the removable, cleanable Ram Bins located under the flat floor. 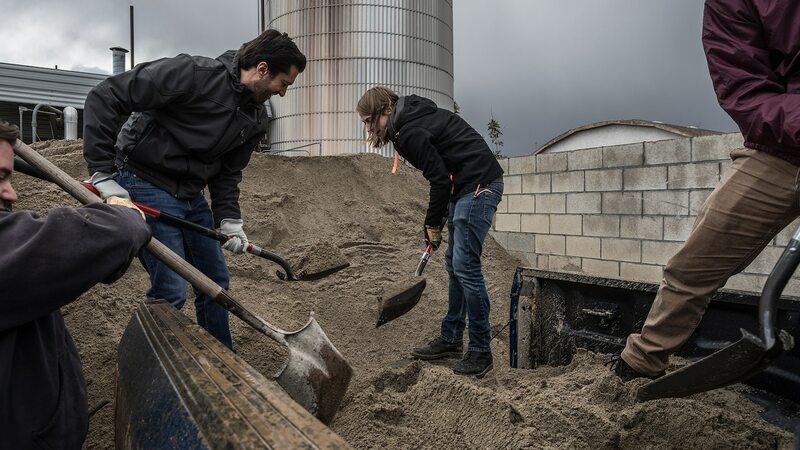 The bins can even be used as a ruler in case you misplace your tape measure. 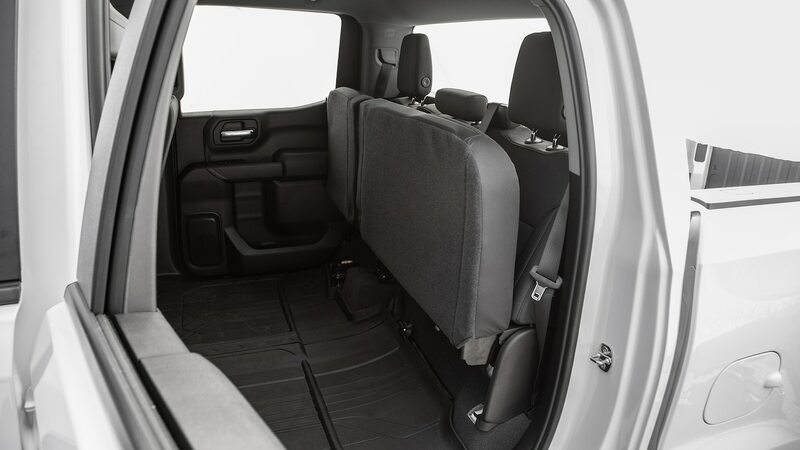 The immense back seat flips up in its entirety, lacking a 60/40 division like the Silverado and F-150 offer. 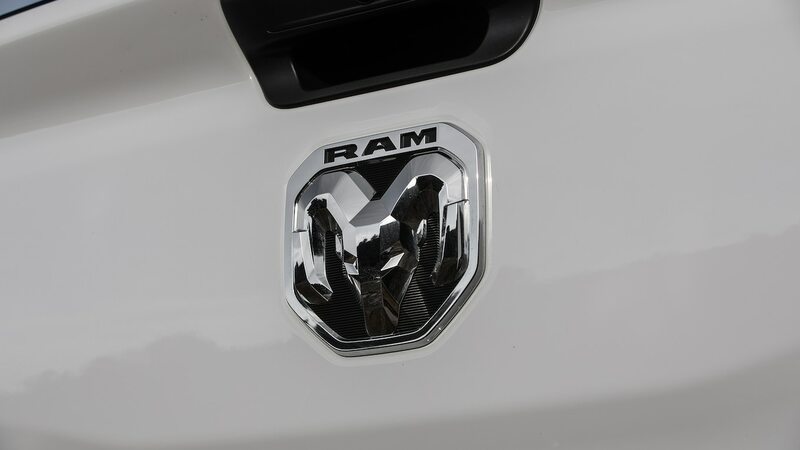 Scott docked the Ram practicality points for that one. 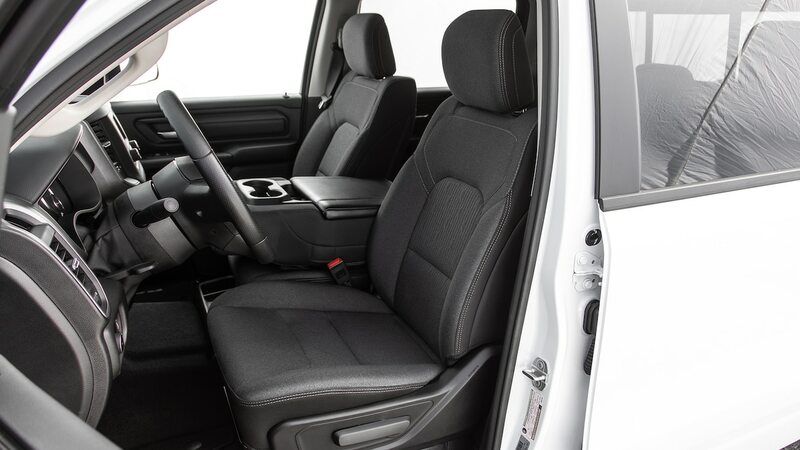 We enjoyed the F-150’s great visibility and comfortable vinyl seats. 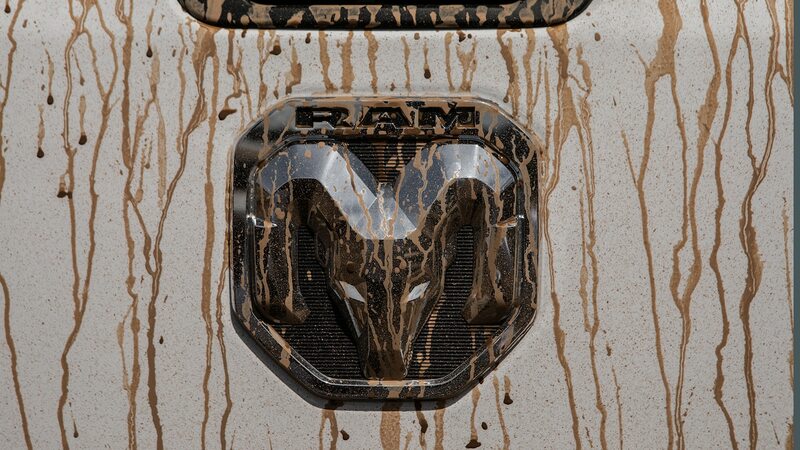 (I know, right?) 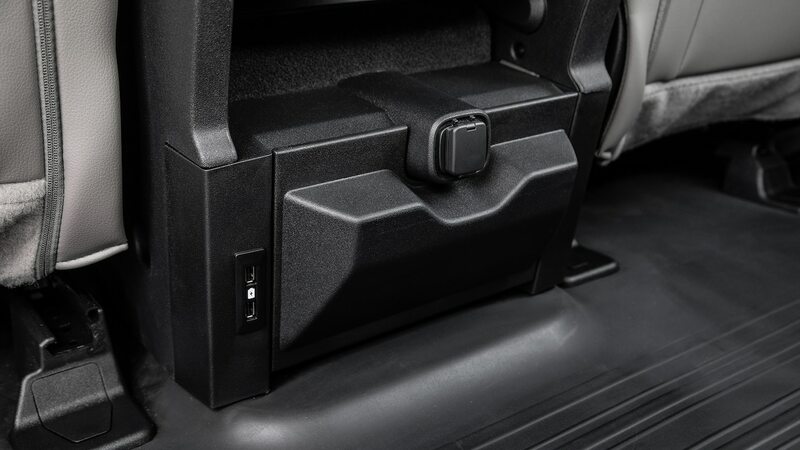 The two-tone cabin had clever details, including a dedicated phone bin, rear USB ports, and a cubby under the front center seat. 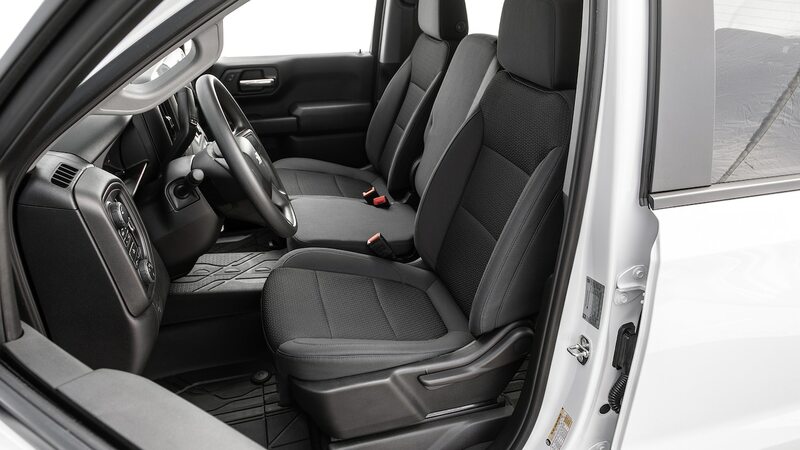 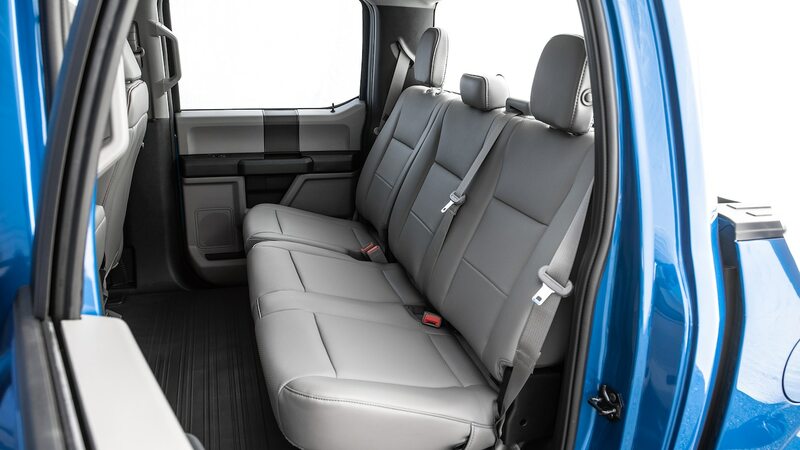 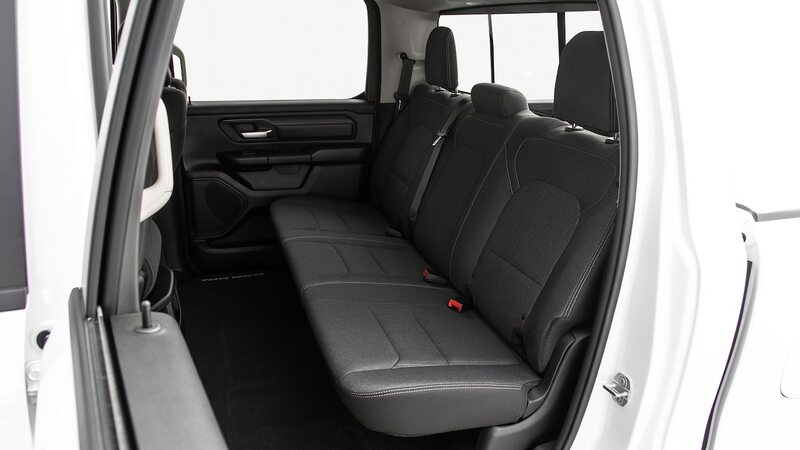 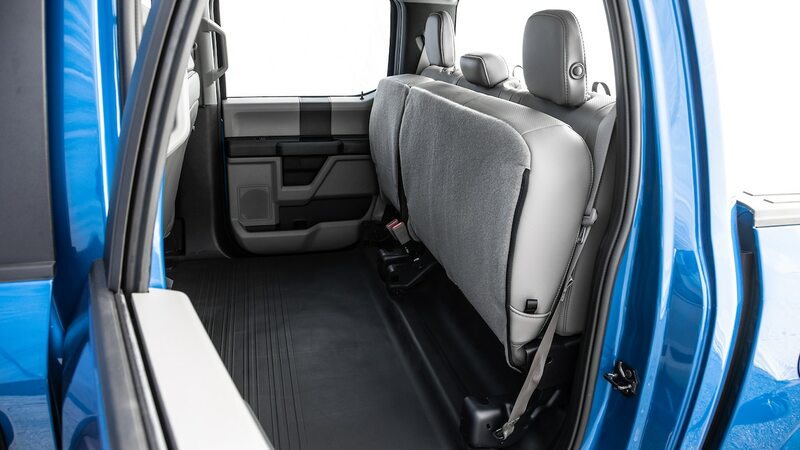 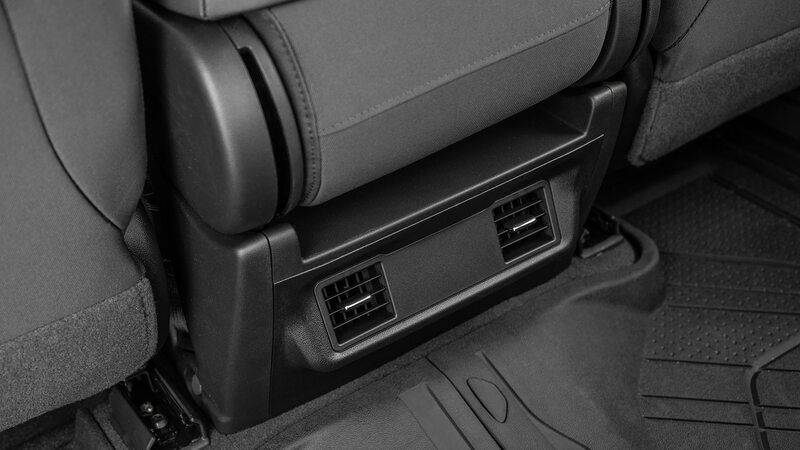 Back-seat passengers have ample space, but we lamented the lack of air vents, something Ram and Chevy offer standard. 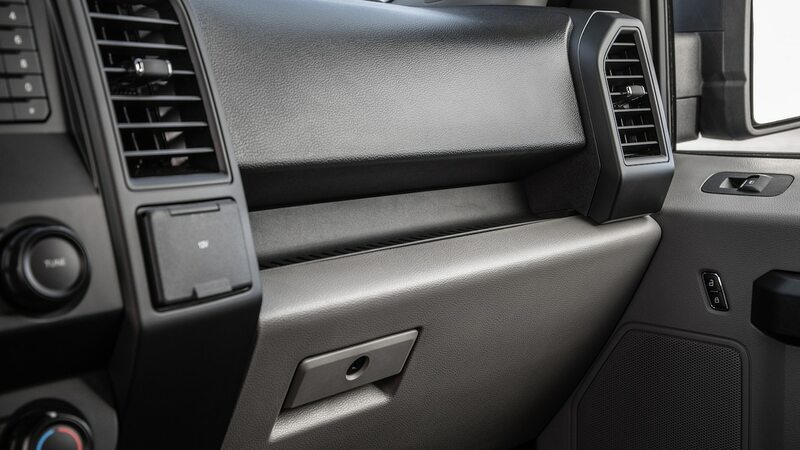 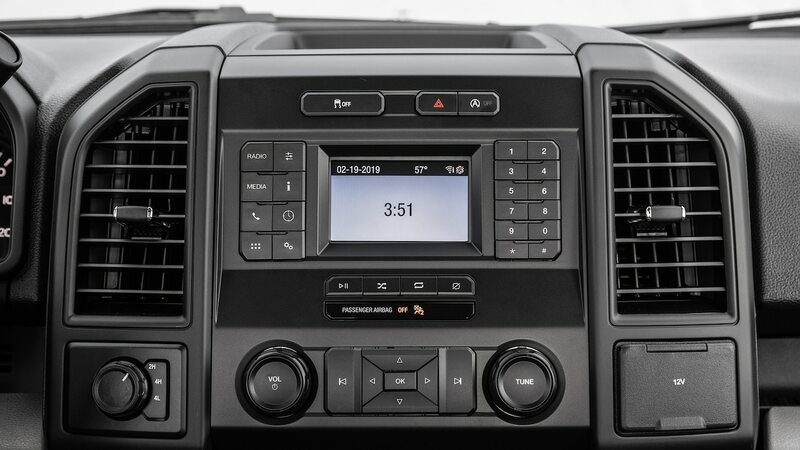 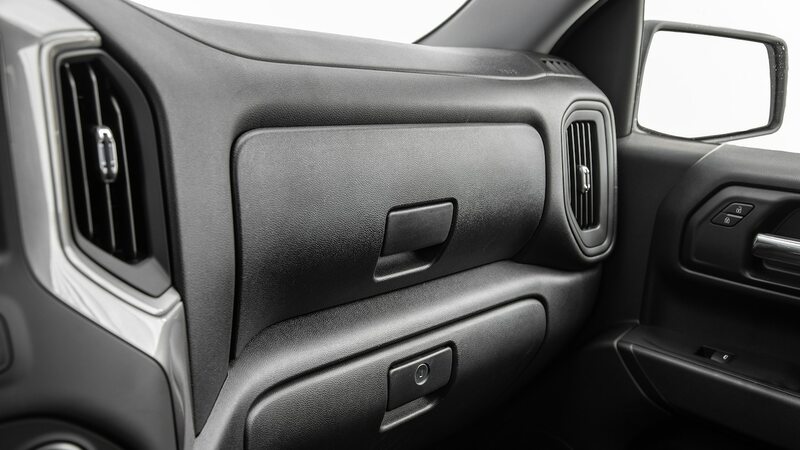 With a true work truck interior, the F-150 was the only one that lacked a touchscreen, but it was easy to control the small display with the buttons below it. 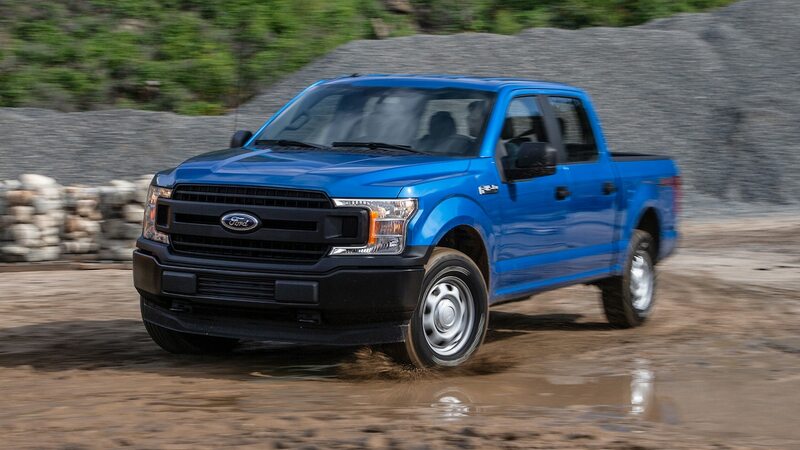 On the road, Ford’s 3.3-liter engine felt like the weakest of the three. 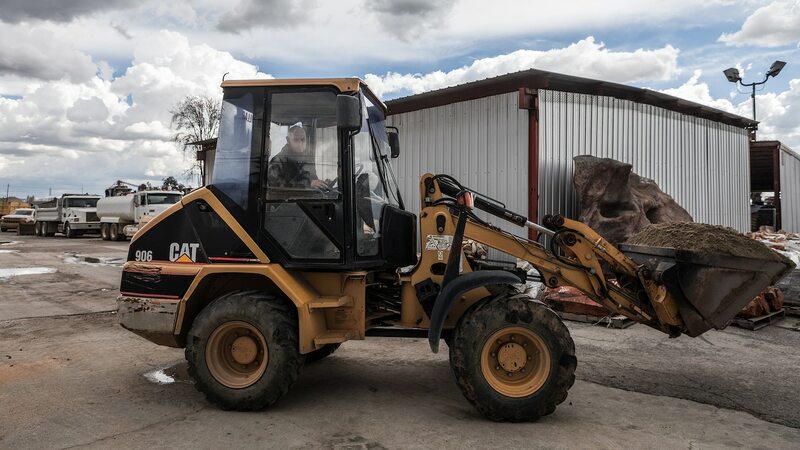 “On level ground and on the highway it’s totally fine—it has decent passing power and relatively smart shifts—but this thing struggles when you’re dealing with ascents and descents,” Christian said. 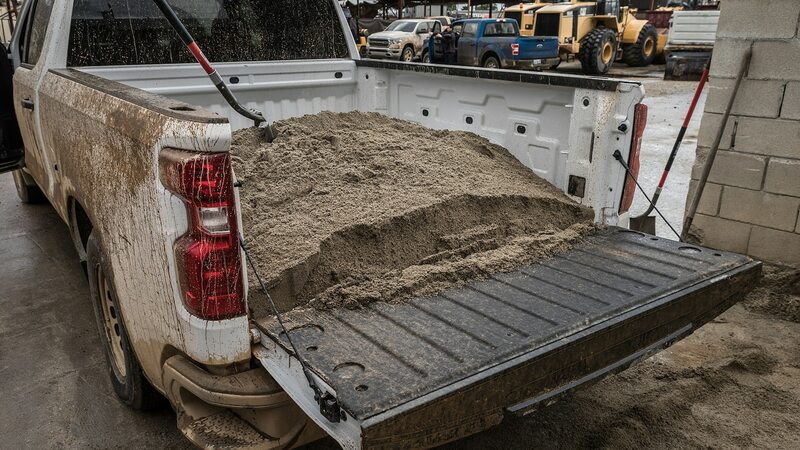 When the truck is free of additional weight, we noticed that the ride was busier, showing more bounces when driving over the broken, undulating pavement of Portuguese Bend’s slow-motion landslide. 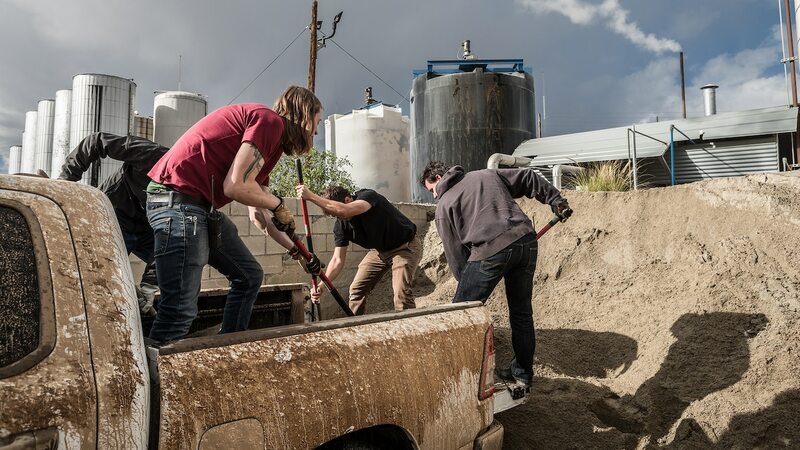 When we strapped a 600-pound (272-kg) Honda Rancher ATV to its bed, the aluminum-bodied truck’s ride actually improved. 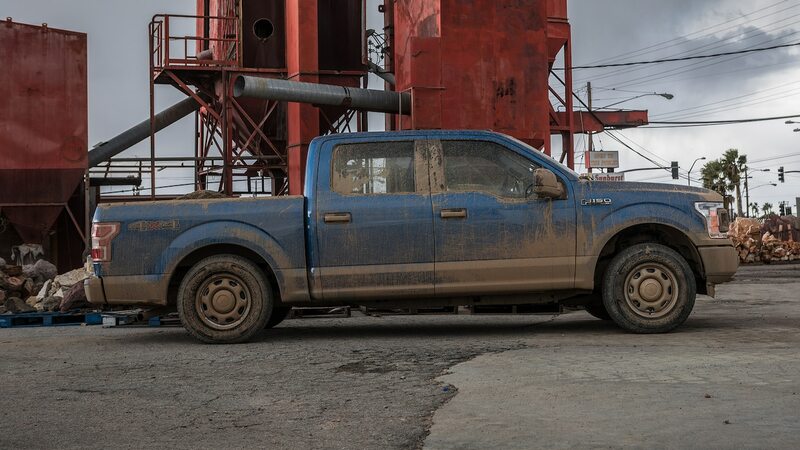 The F-150 felt more planted and controlled with the additional weight, but Christian noticed odd changes in the transmission. 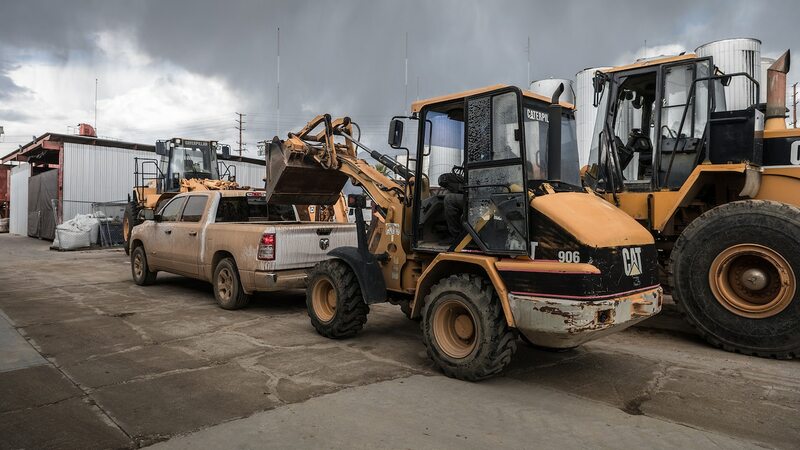 Even when it was in Tow/Haul mode, it upshifted or downshifted too early or too late. 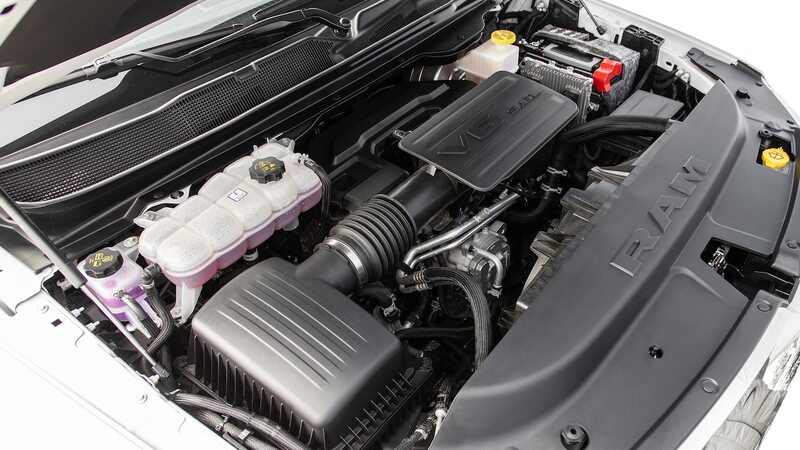 “That’d be fine if the 3.3-liter V-6 had torque to spare, but it doesn’t,” he said. 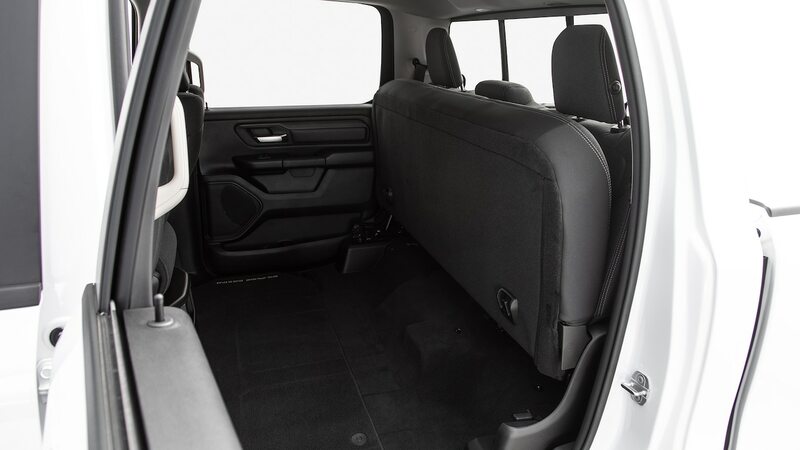 Besides looking at the interior, beds, and ride quality, we also performed our Real MPG tests. 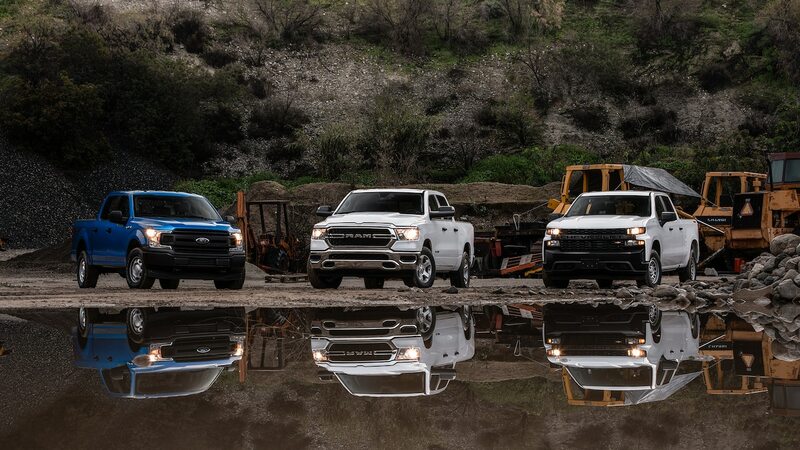 To our surprise, all three trucks scored better than their EPA ratings. 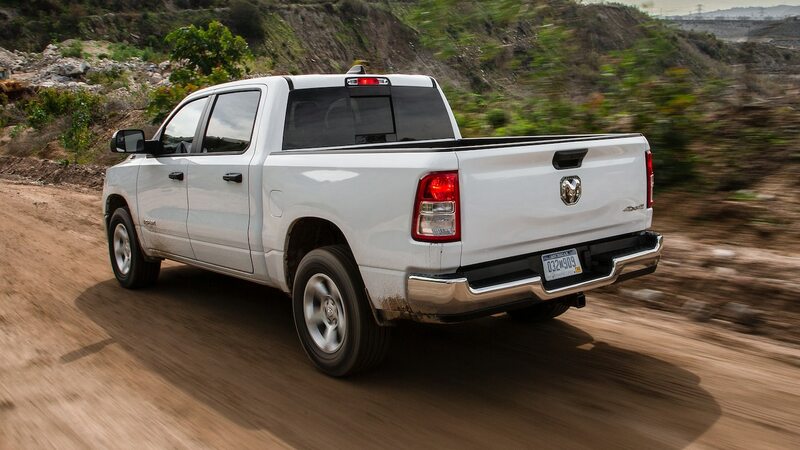 But the Ram still got the best fuel economy numbers. 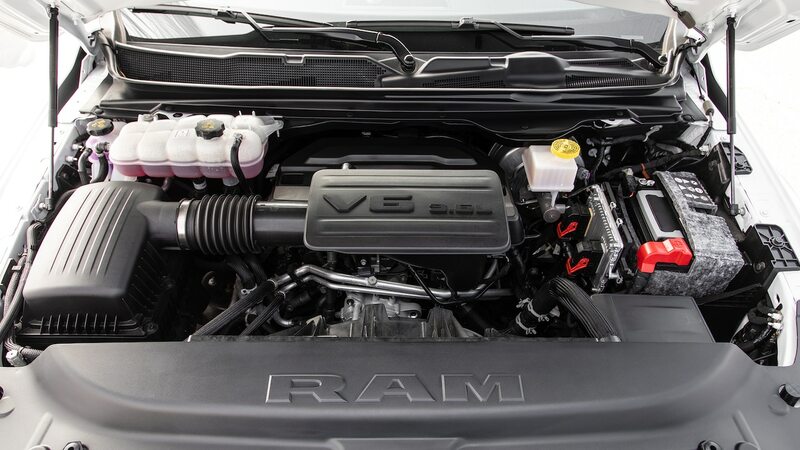 Delivering 20.3/28.5/23.3 mpg (11.6/8.2/10.1 L/100 km) city/highway/combined, the Ram’s mild hybrid engine and eight-speed transmission shined on our test. 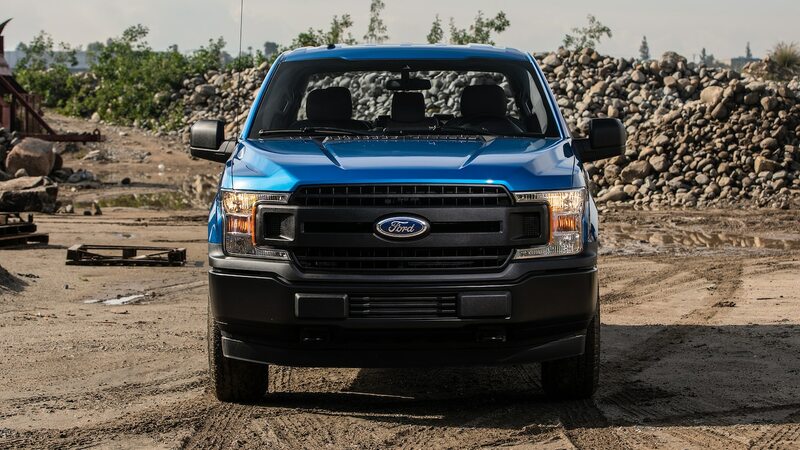 Ford came in second place with 19.3/27.0/22.1 mpg (12.2/8.7/10.6 L/100 km), and the Silverado delivered 17.6/25.0/20.3 mpg (13.4/9.4/11.6 L/100 km). 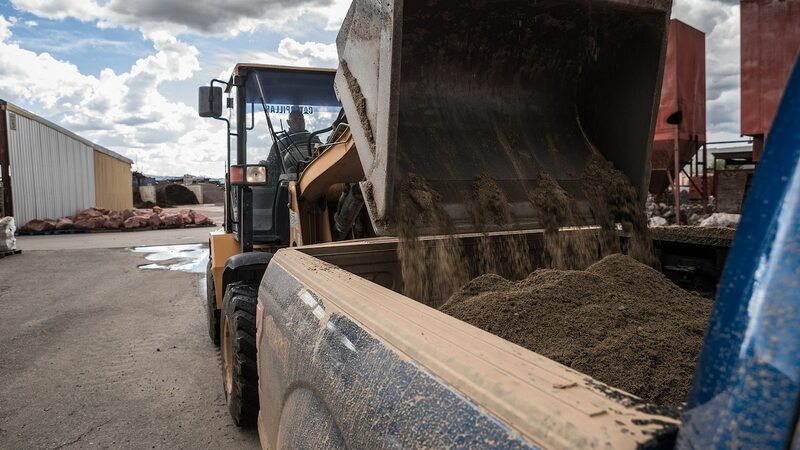 That spread might not seem like much, but it is if you’re a fleet manager gassing up a couple dozen trucks every few days. 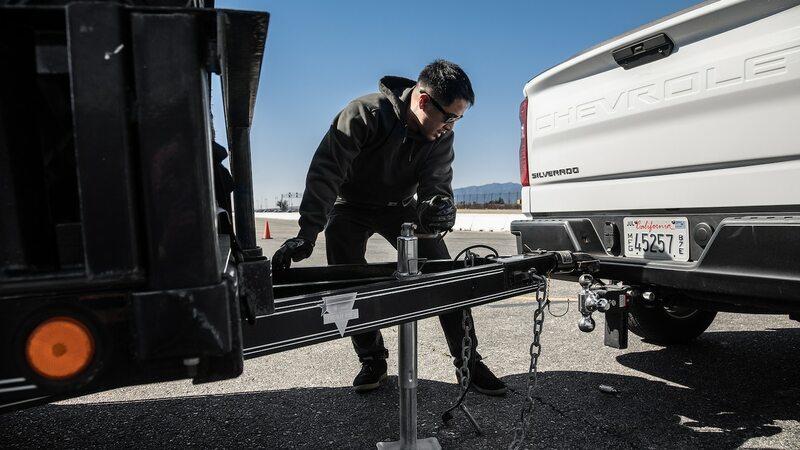 In addition to unladen 0–60 tests at the track, we also attached a 3,398-pound (1,541-kg) trailer to see how each truck fared under load. 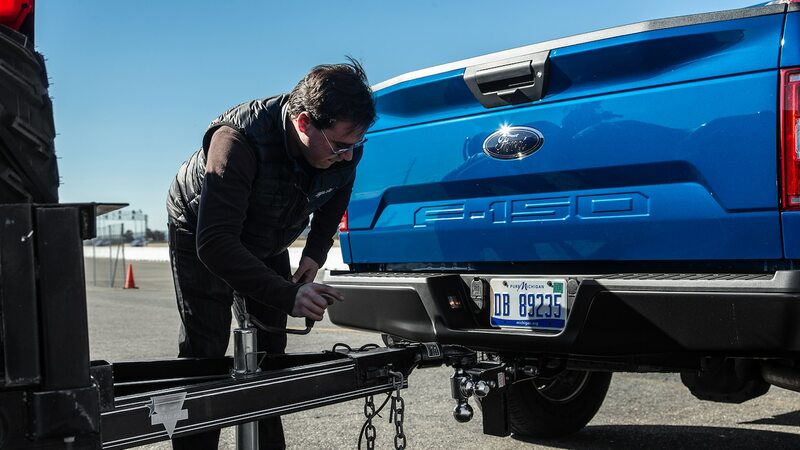 Although this weight was less than half the towing capacity of each truck, the results and the way the trucks behaved was remarkable. 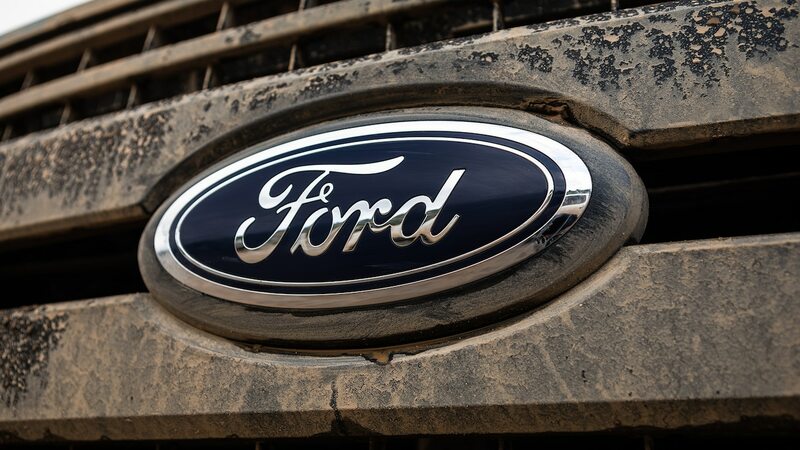 The wheeziness of Ford’s engine was evident from the start. 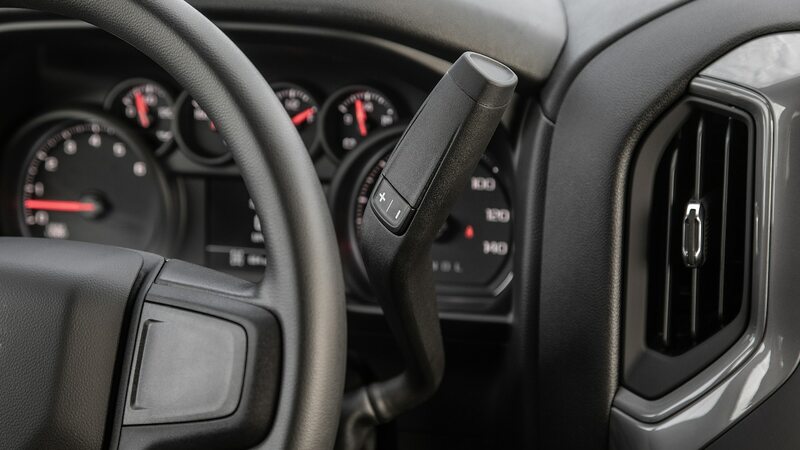 It was the slowest truck with the trailer—taking 13.9 seconds from 0 to 60 mph—and it showed the worst body control. 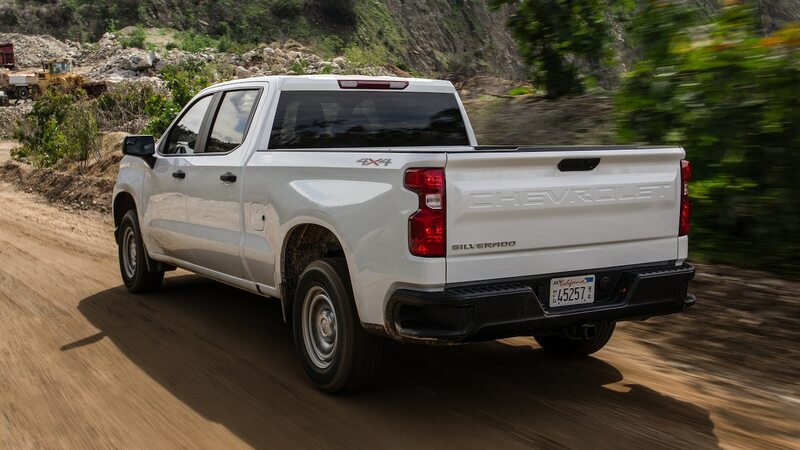 “The engine took a while to wake up,” associate road test editor Erick Ayapana said, adding that the rear end exhibited a bit of lateral movement. 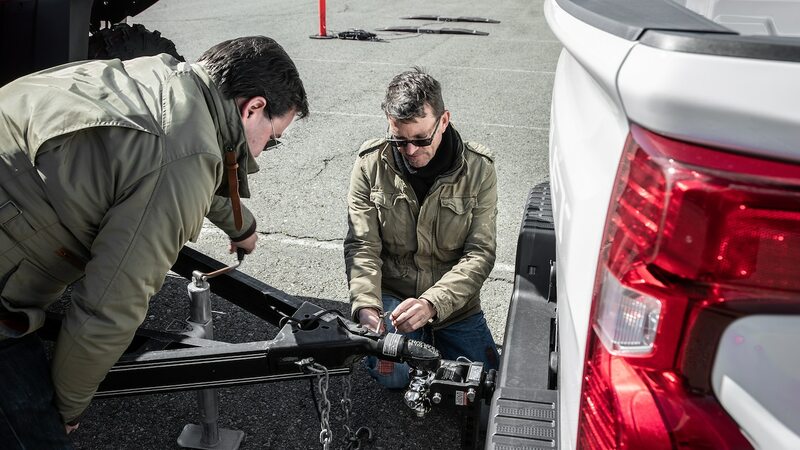 A few hours before, I towed the same trailer more than 60 miles (97 km) from Torrance to Fontana and felt a real sense of insecurity. 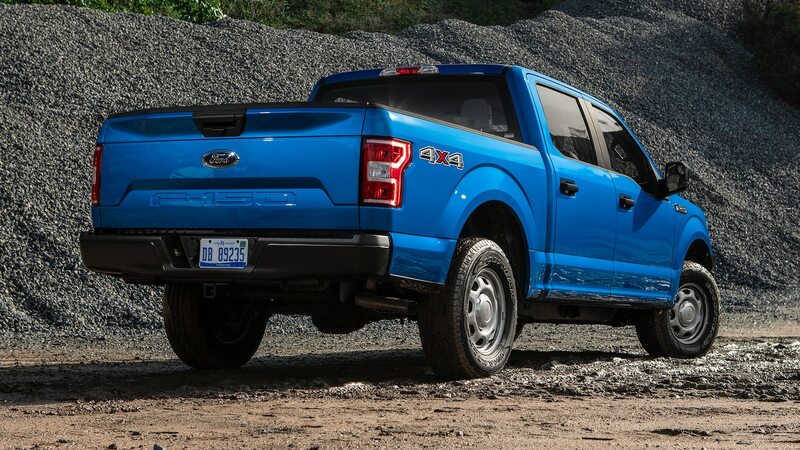 It wasn’t just the lack of power, but the rear end felt unstable and the brakes lacked bite—despite the truck’s 7,656-pound (3,473-kg) towing capacity. 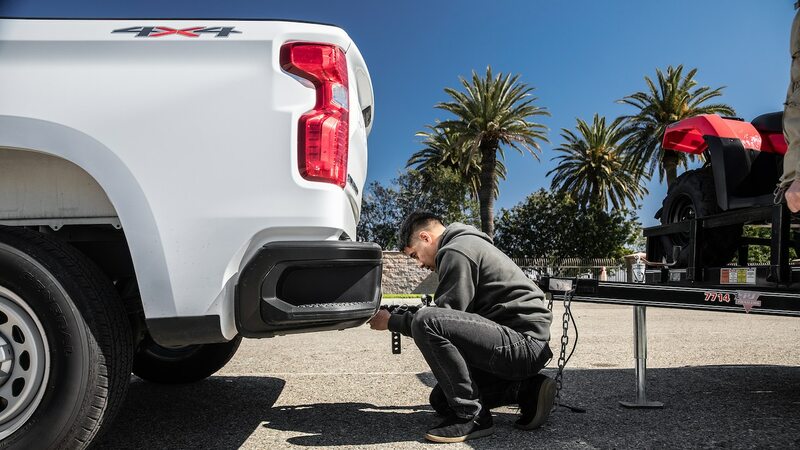 With its 305 lb-ft of torque, the Silverado’s punch was noted when towing. 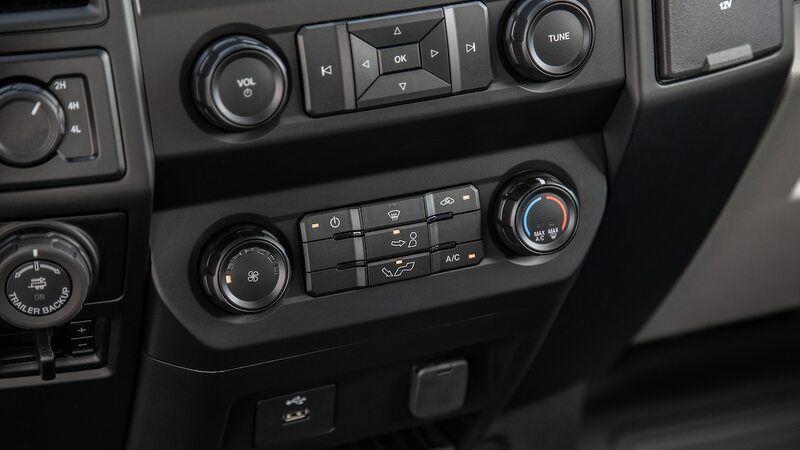 Erick remarked that the acceleration was decent and the gears shifted at the correct time, with the body showing good control during acceleration and braking. 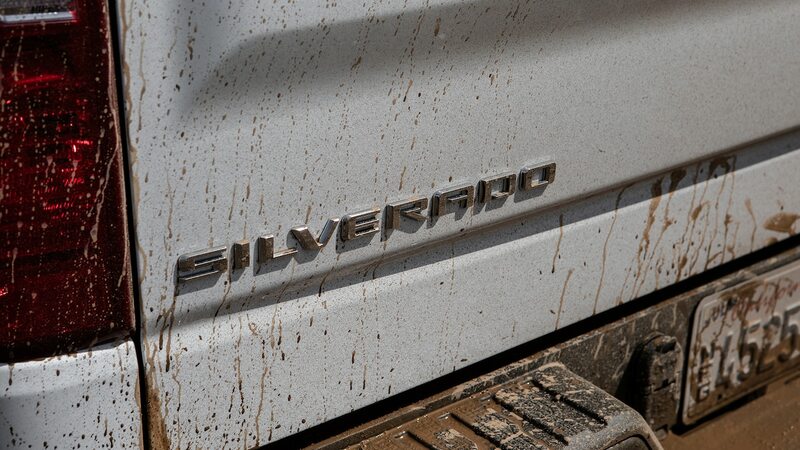 The Silverado came in second place on the towing 0–60 run, taking 13.0 seconds. 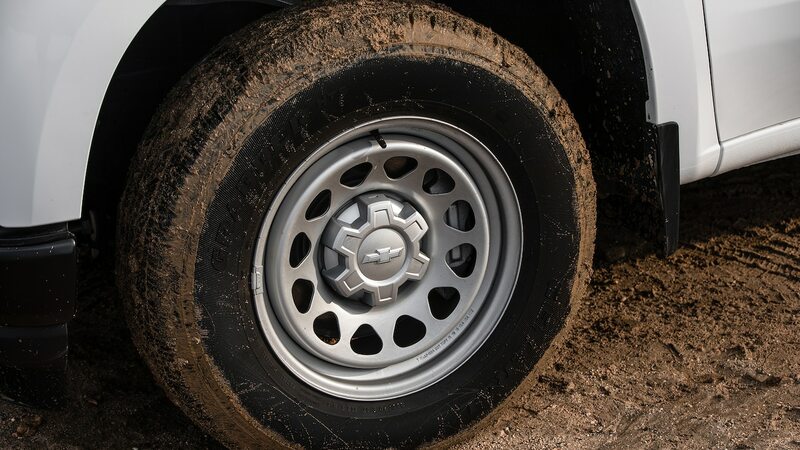 When towing on public roads, Christian complained about body control while going over speed bumps or poor pavement. 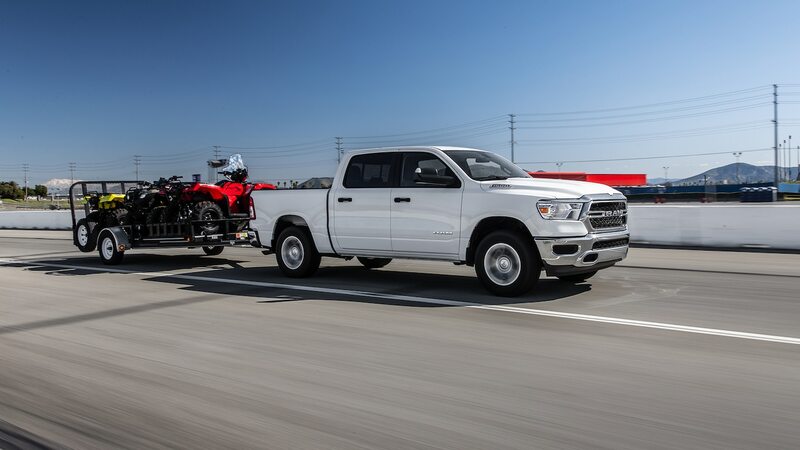 Our tester’s towing capacity of 7,656 pounds (3,473-kg) was the highest of the three here, by a whisker. 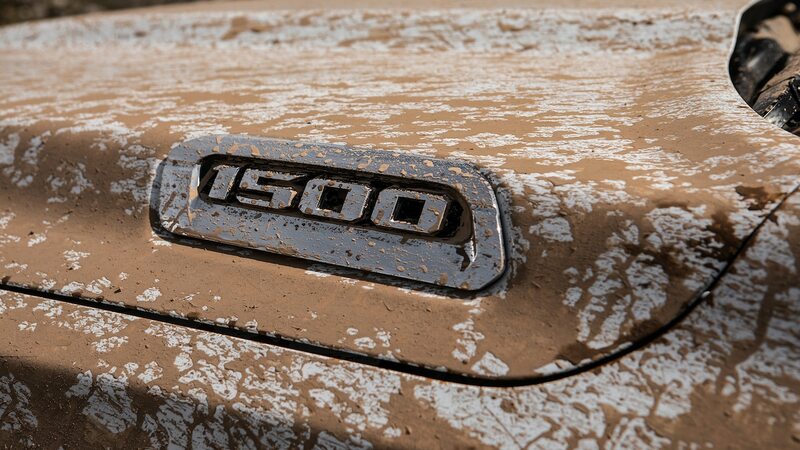 The Ram 1500 felt the strongest when towing. 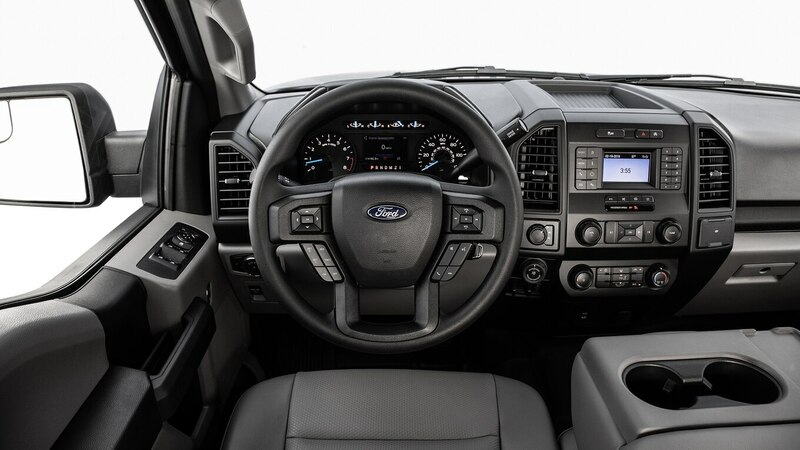 “Engage Tow/Haul mode, and the transmission will hold the gears a lot longer than you’d expect,” Scott said. 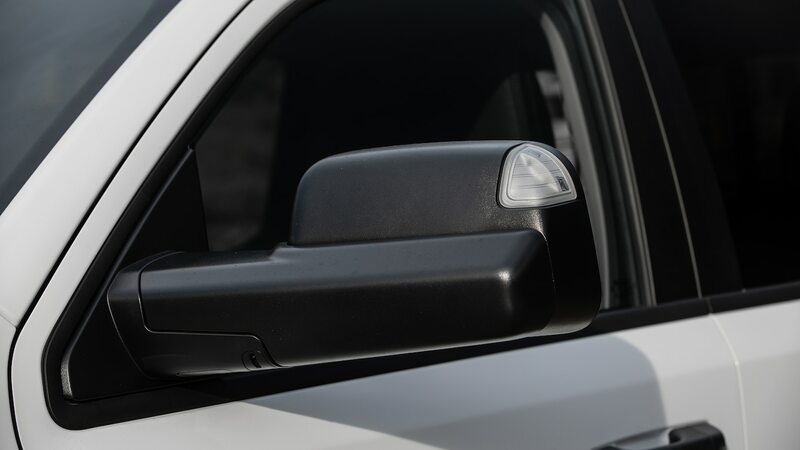 He also appreciated the towing mirrors when driving on the highway. 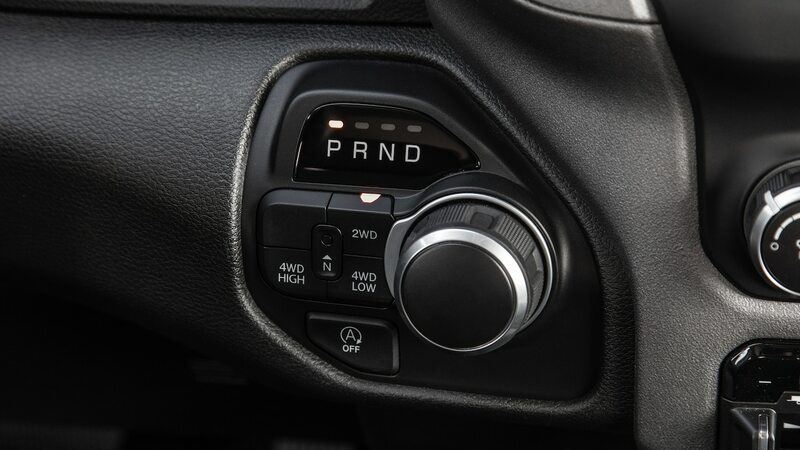 At the track, Erick noticed a bit of wheelspin off the line before stability control intervened, but he applauded the transmission’s behavior and its body control. 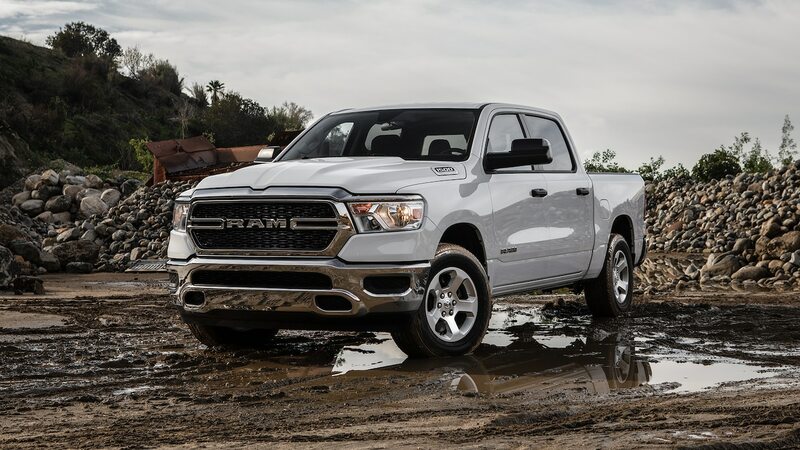 Taking 12.3 seconds from 0 to 60 mph, the Ram didn’t have any problems towing 44 percent of its 7,623-pound (3,458-kg) towing capacity. 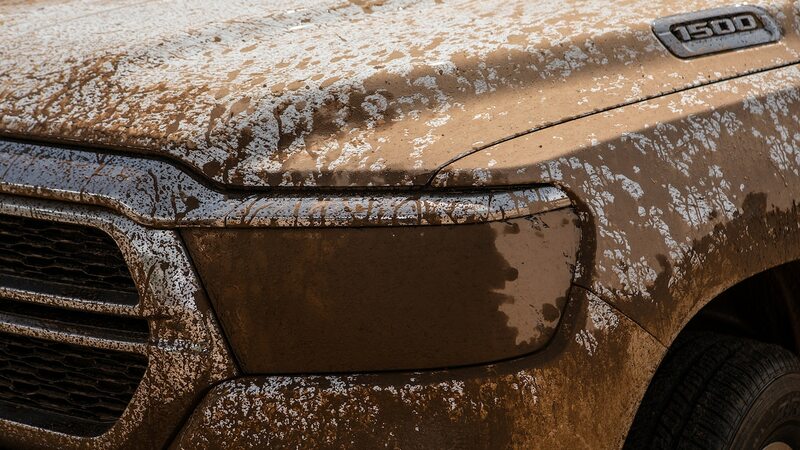 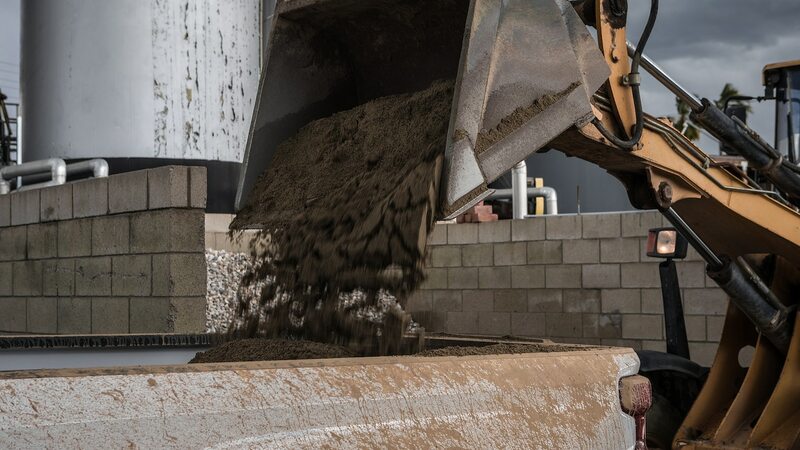 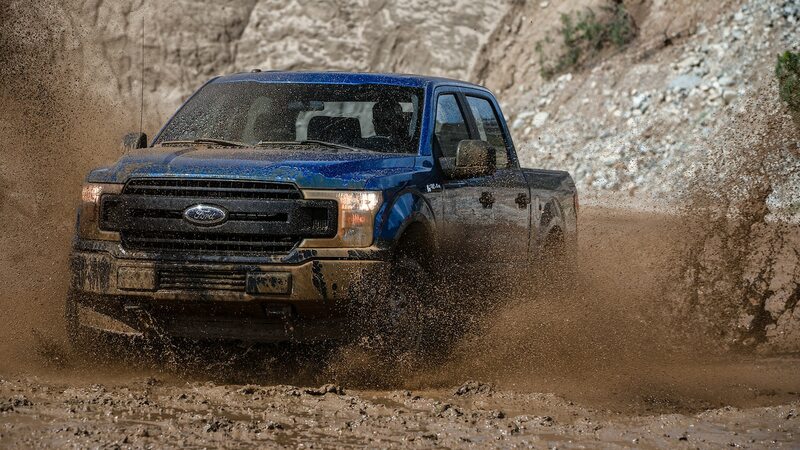 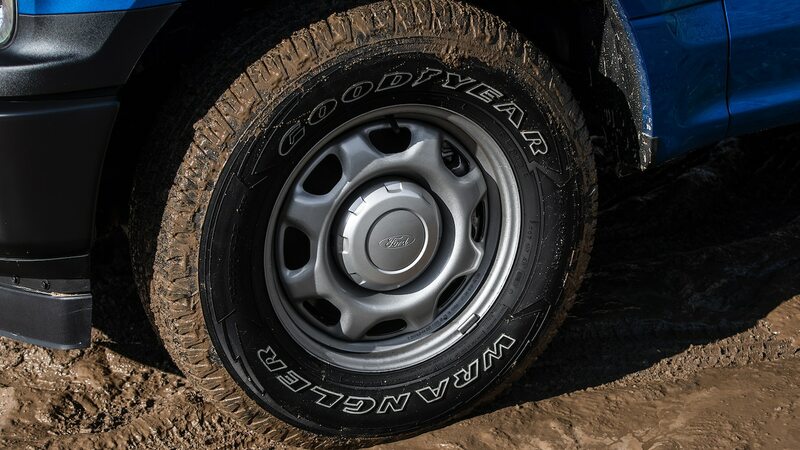 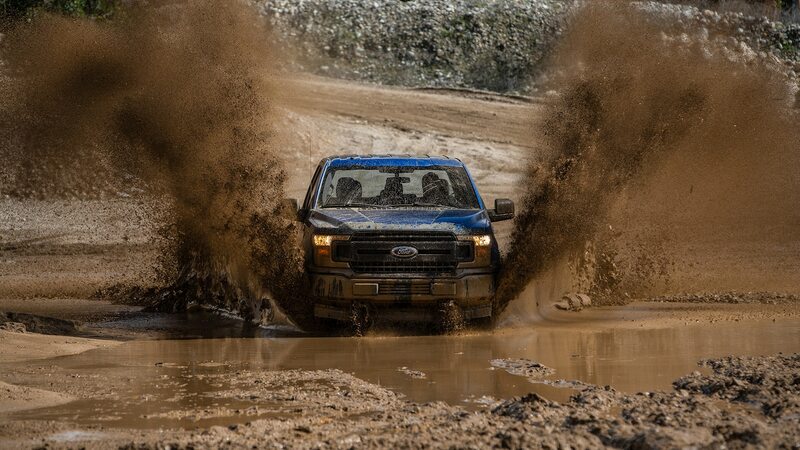 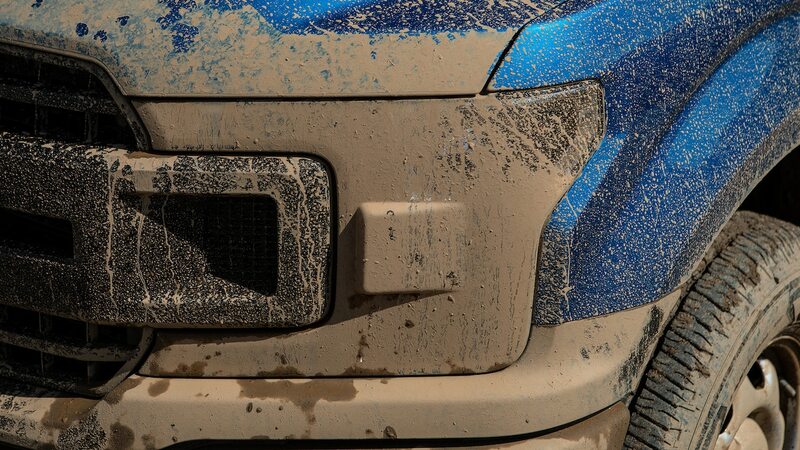 At a muddy Irwindale quarry northeast of Los Angeles, we took our payload test a step further. 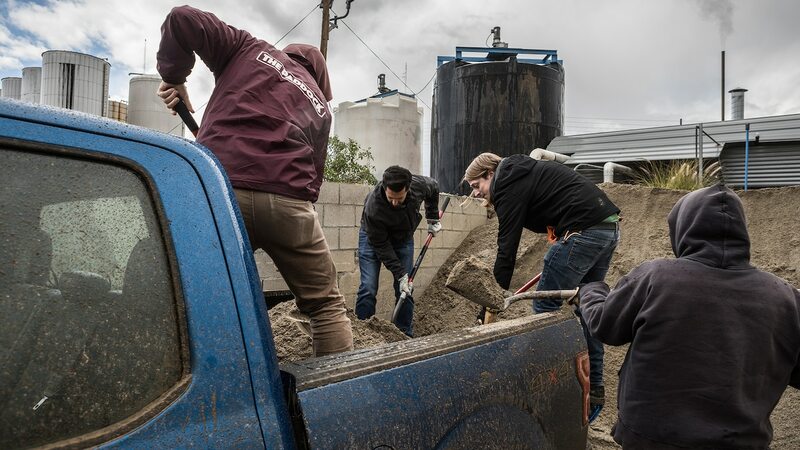 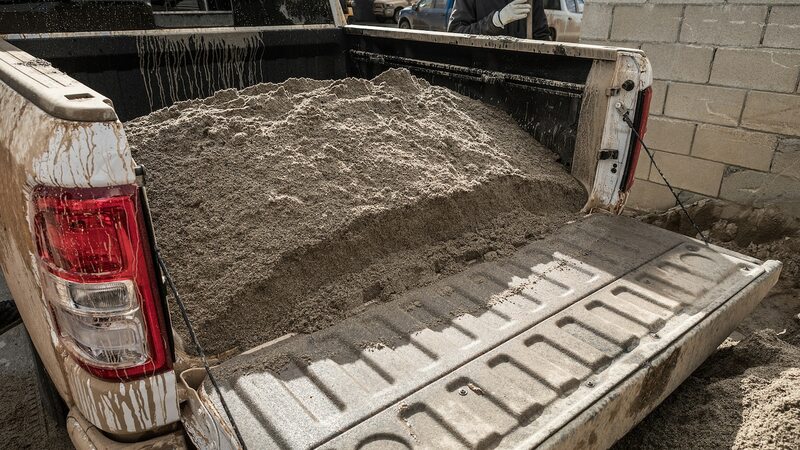 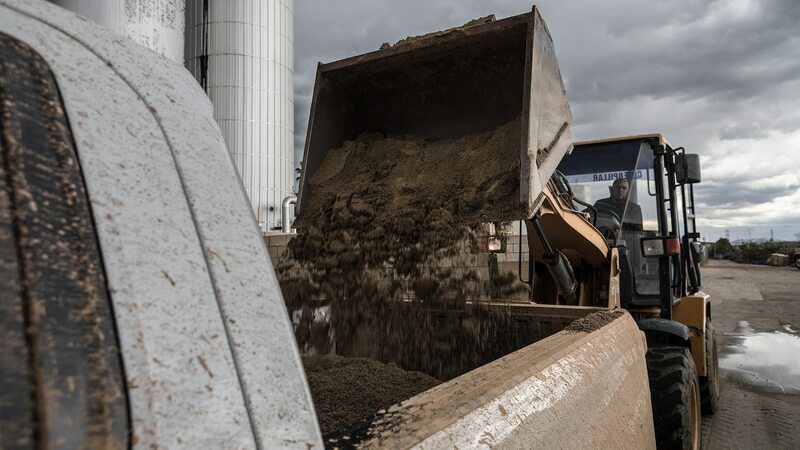 With the help of a tractor, we loaded 1,800 pounds (816 kg) of sand into the bed of each truck and headed on a 10-minute loop on nearby streets. 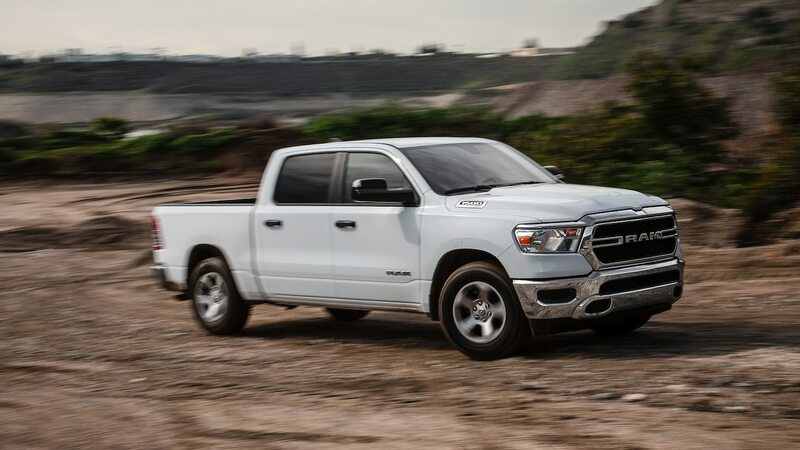 That amount turned out to be just slightly more than the payload capacity of the F-150 (1,644 pounds (746 kg)) and Ram 1500 (1,773 pounds (804 kg)), while the Silverado was under capacity (2,006 pounds (910 kg)). 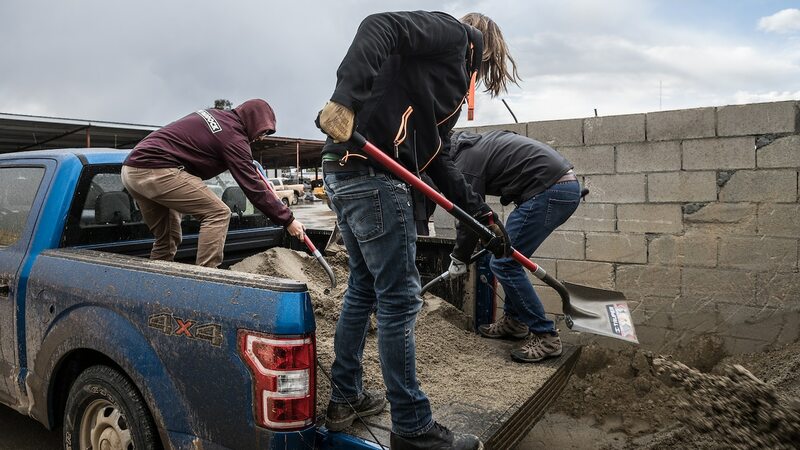 We did this because many truck owners don’t know their truck’s payload capacity—or ignore it to avoid a second Home Depot run when they gotta get the job done. 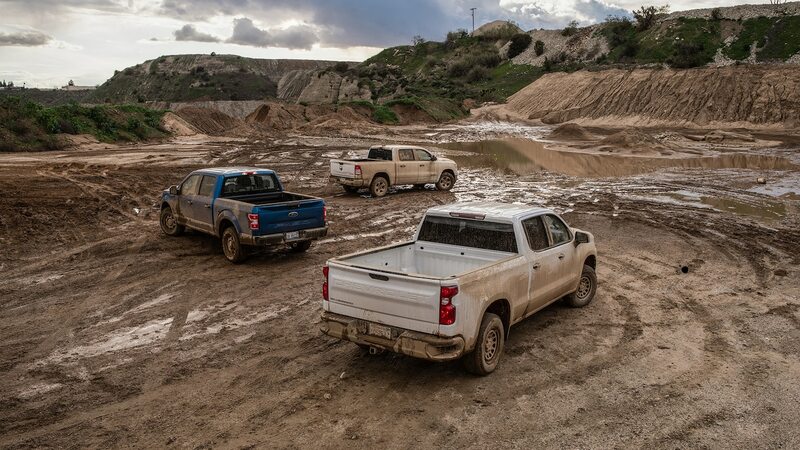 When driving over the same dips where the Ram excelled, the Silverado—despite being the only truck under capacity—showed the worst handling of the three trucks. 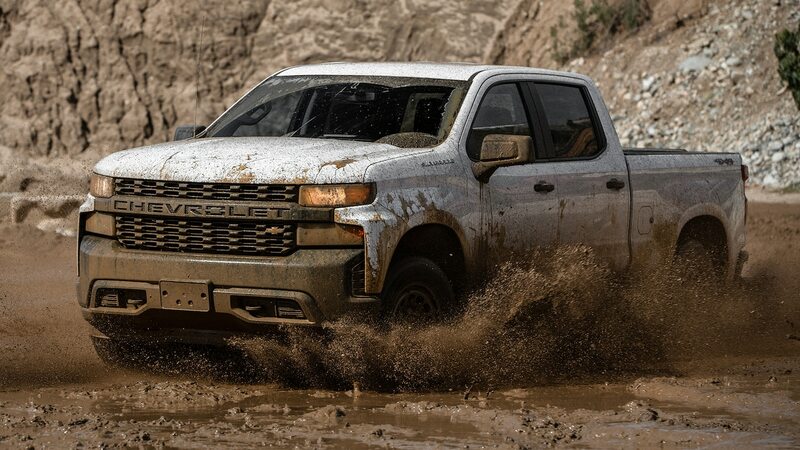 At the 25-mph (40-km/h) speed limit and driving over a dip, the Chevy bounced nine times compared to the Ford’s four and Ram’s two. 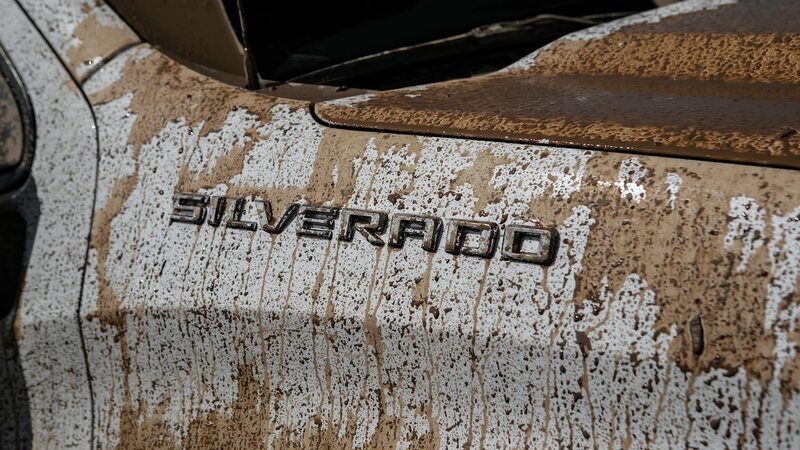 Body control aside, the Silverado’s powertrain shined. 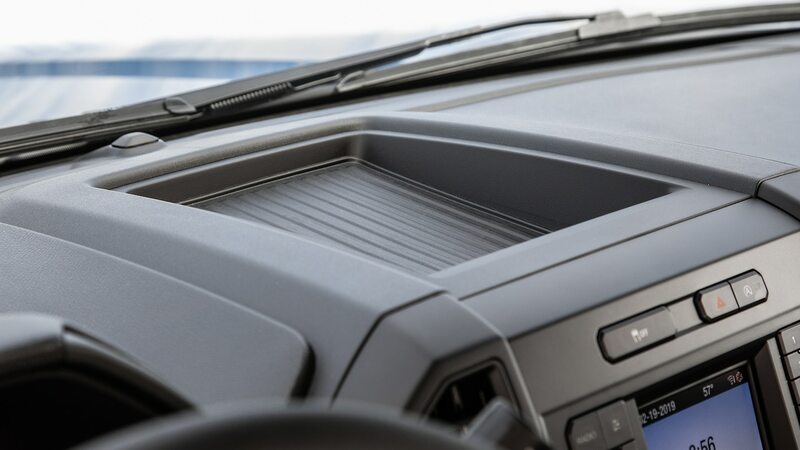 We also enjoyed how well the transmission and engine work together—whether the truck is hauling a big payload or simply cruising empty. 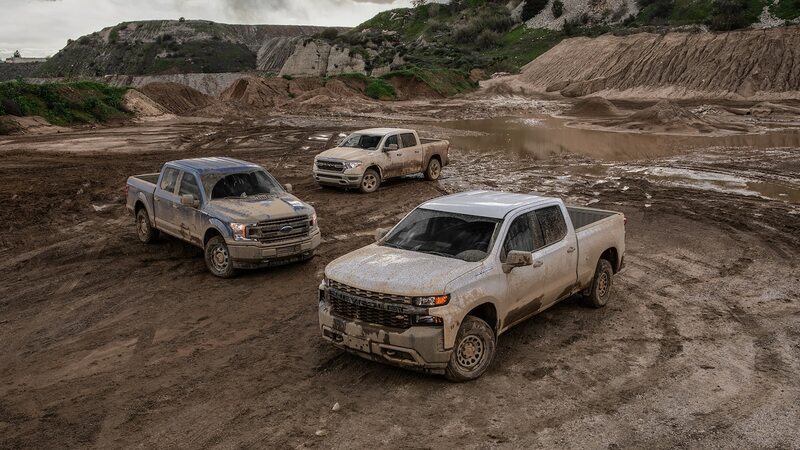 Being the most over capacity, the Ford’s engine obviously struggled, but the F-150’s handling wasn’t as bad as the Silverado’s. 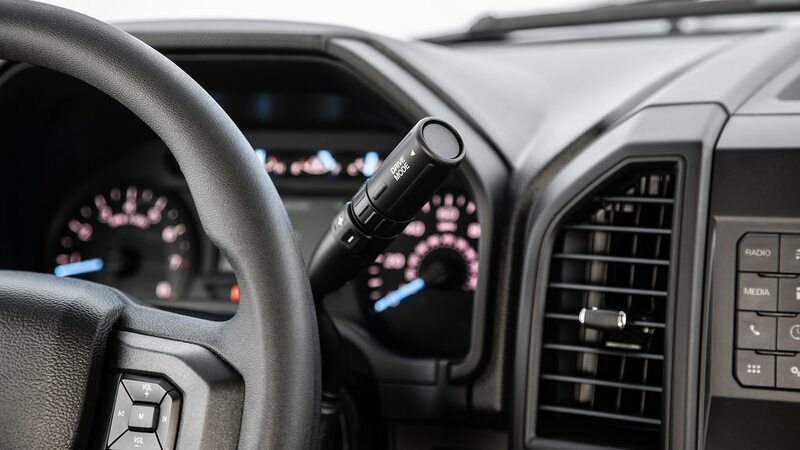 “It’s softer and less upsetting; there are more little pitter-patters versus the huge whoops you get in the Silverado,” Christian said of the F-150’s ride. 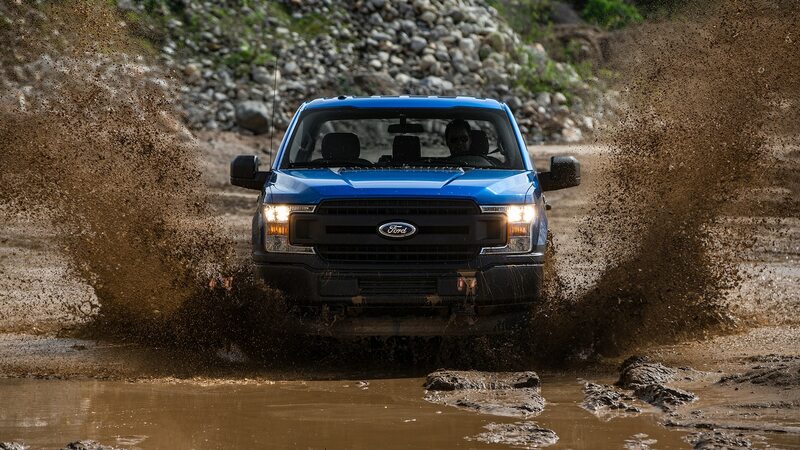 But the F-150’s brakes were its weakest point. 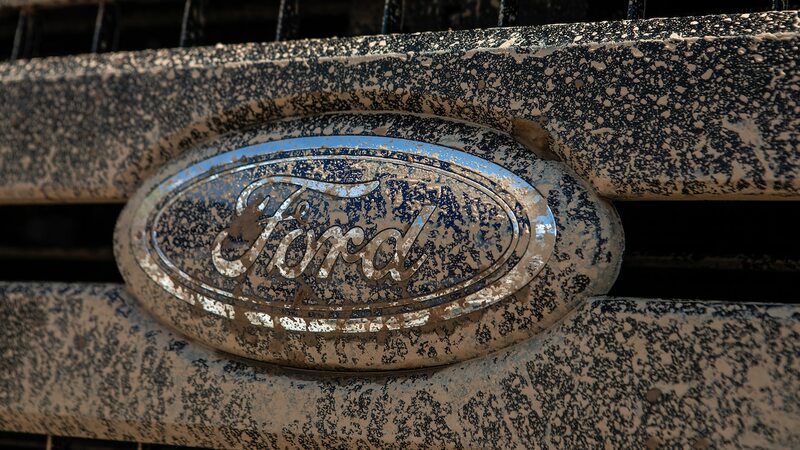 When we approached a stoplight, the Ford required a proper stomp on the brake pedal to make sure the truck slowed down. 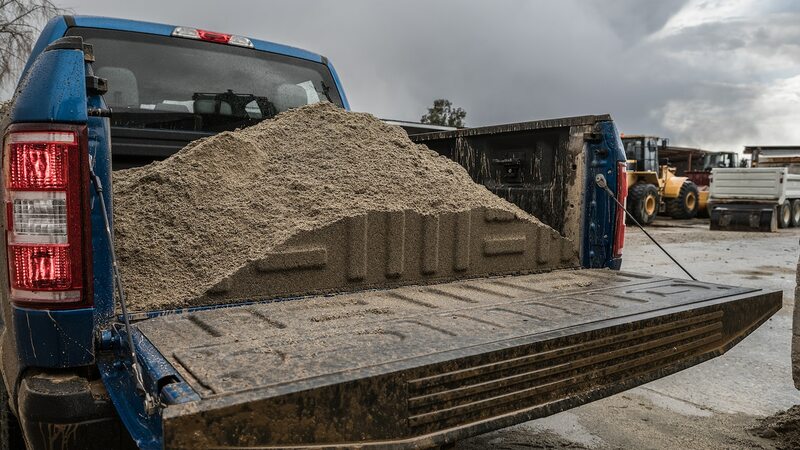 Although it was over capacity, we also noticed issues with its braking when towing, but it wasn’t as apparent as with the sand. 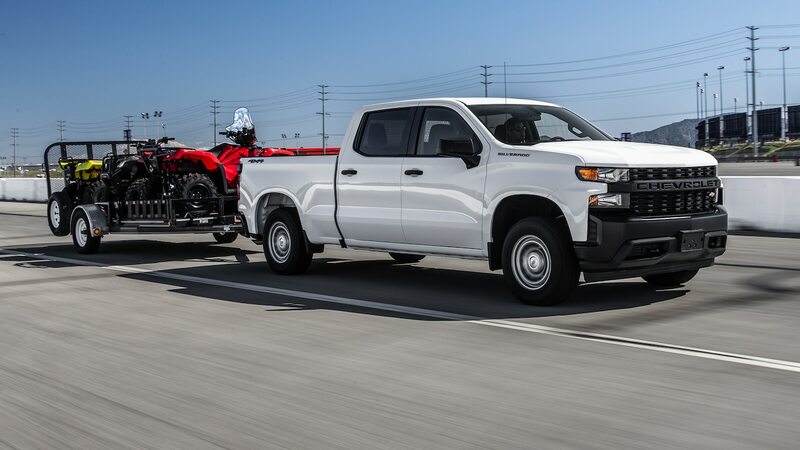 This caught my attention, considering we didn’t notice any braking issues when hauling the ATV and it was the best truck in our unladen braking test at the track. 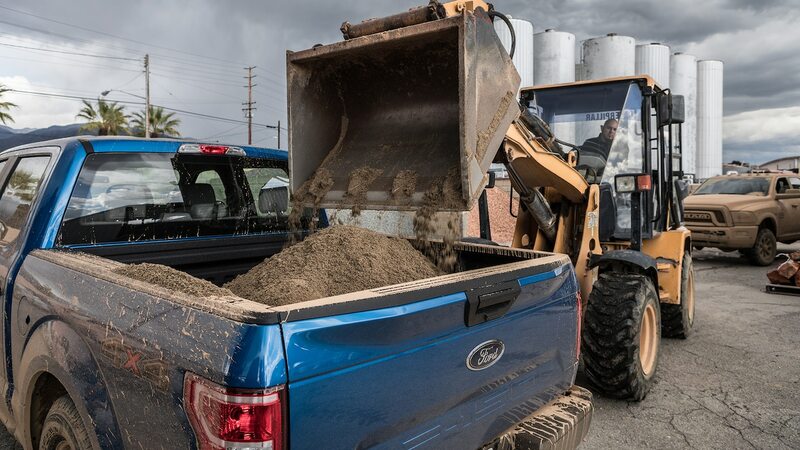 So What’s the Best Work Truck? 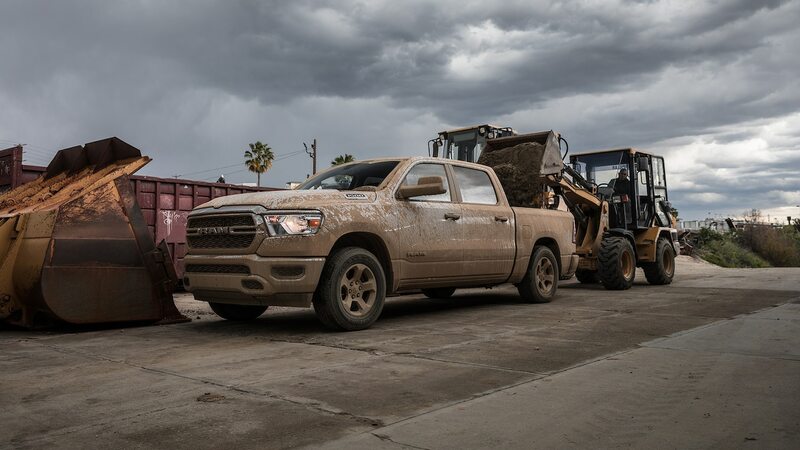 It’s a different era for work trucks. 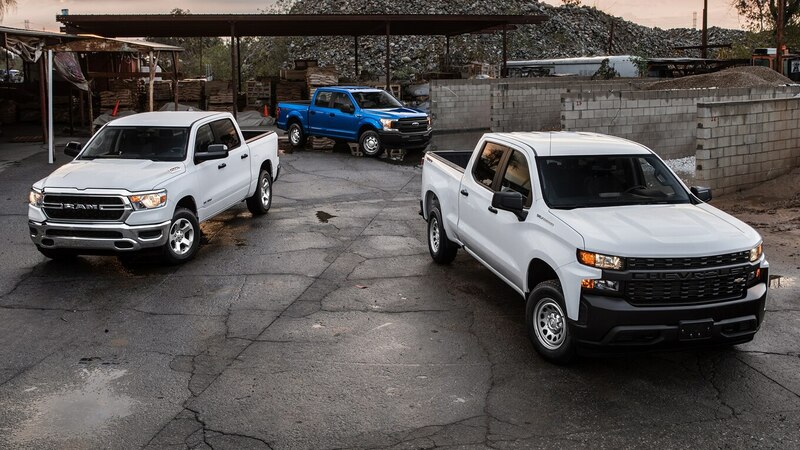 Today’s pickups are an evolution of the trucks from the ’80s. 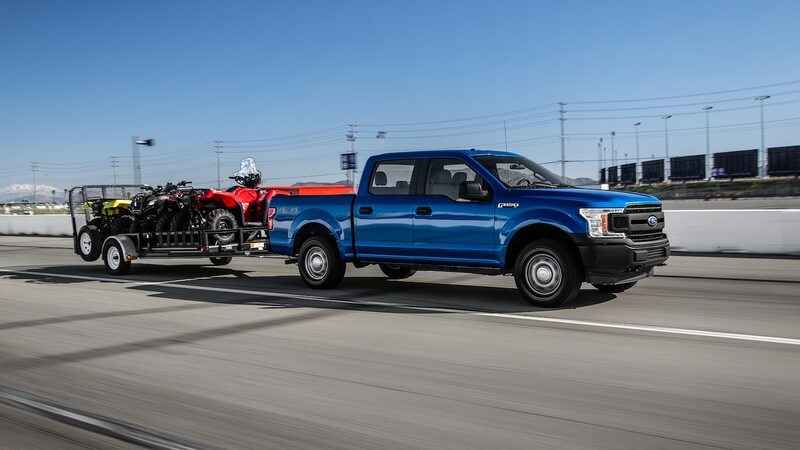 Unlike Chava’s F-150, these trucks can haul and tow more while offering a more refined ride. 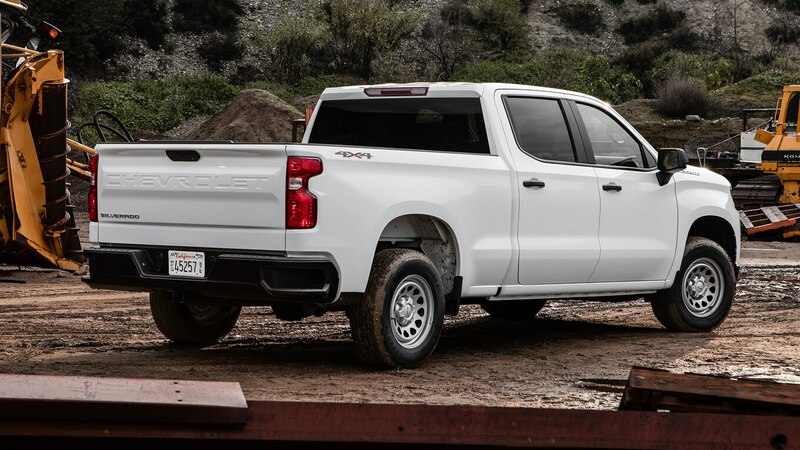 The advancement of engineering and access to technology has upped the truck game, and it will only keep ascending. 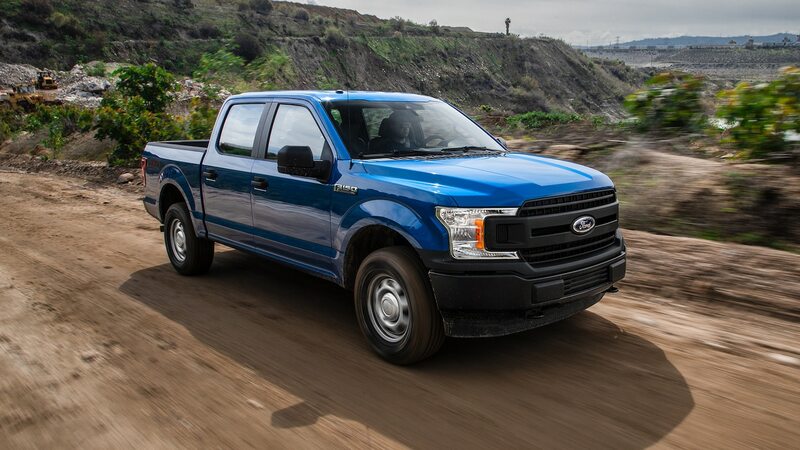 With its 3.3-liter engine, our 2018 Truck of the Year failed to impress us the way the F-Series lineup did two years ago. 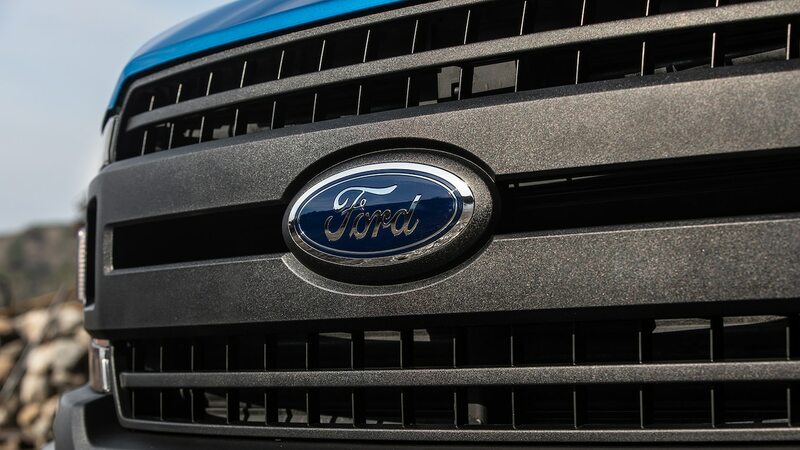 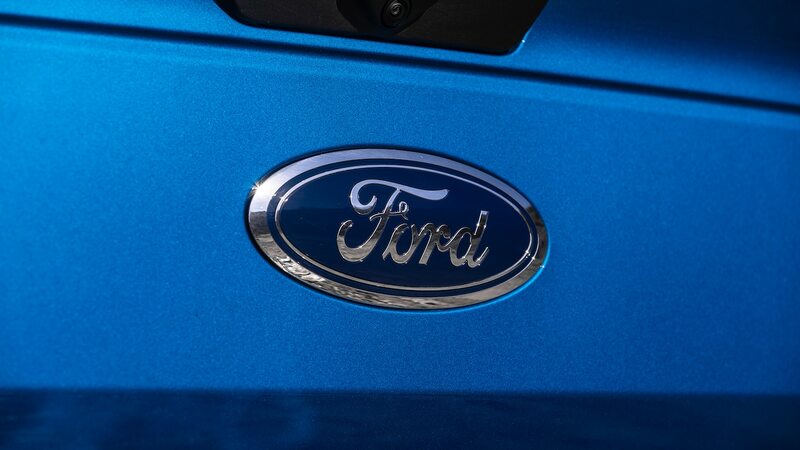 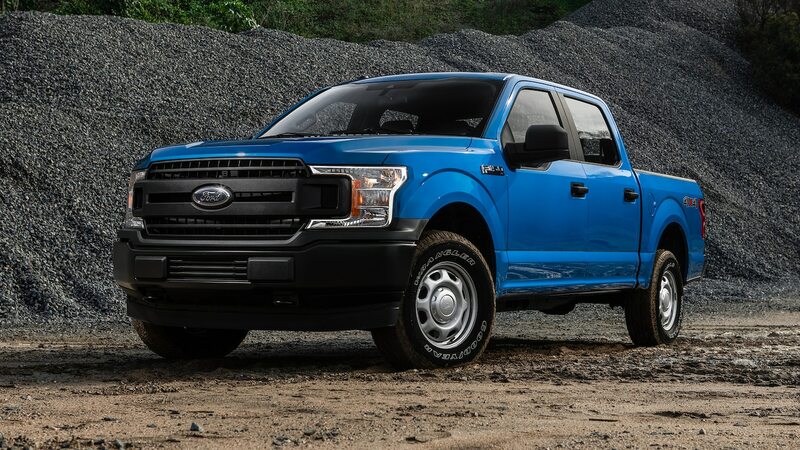 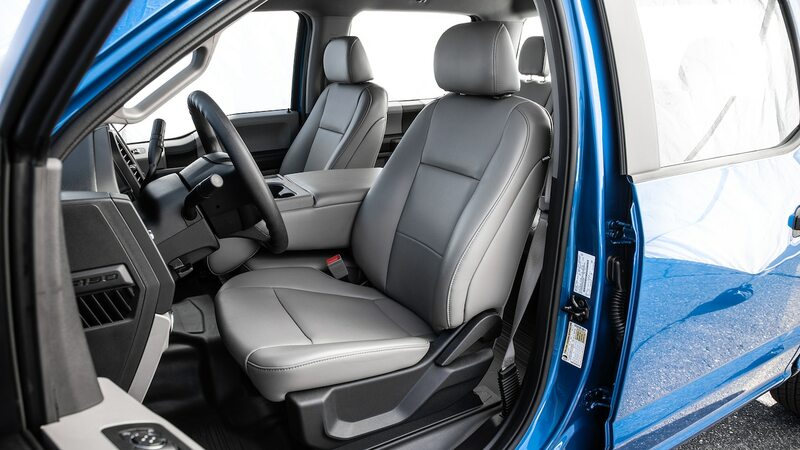 It’s a compelling truck with an attractive and comfortable interior, but the Blue Oval’s base model could have a different story if the engine had more power. 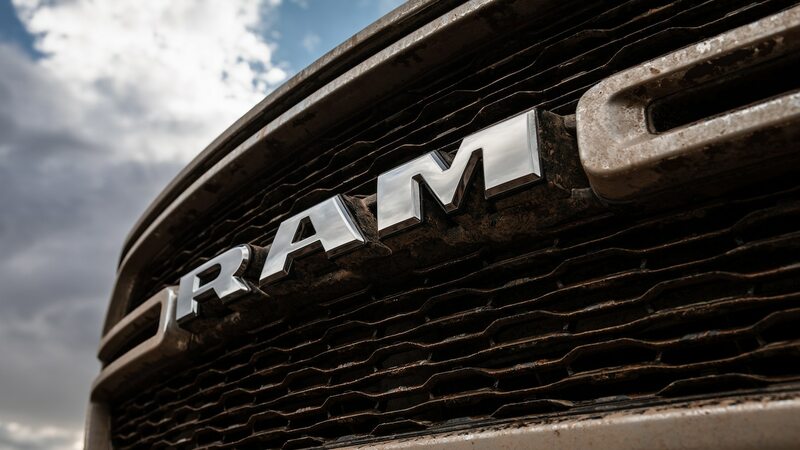 It’s a compelling choice if you’re looking for value. 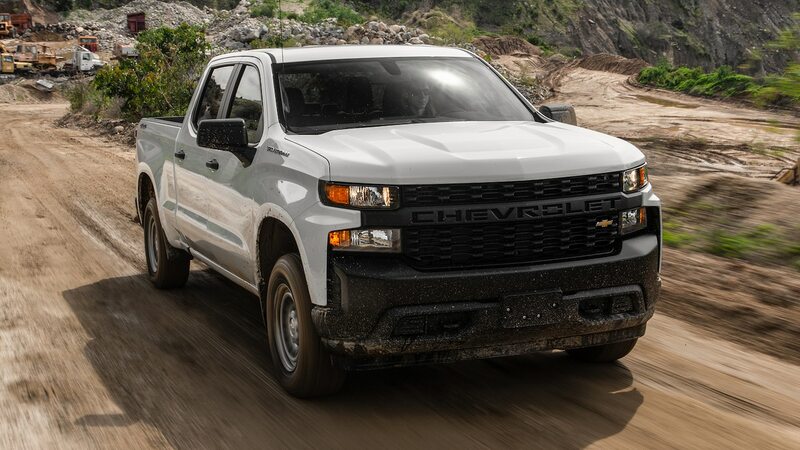 With the lowest price, a punchy engine, and a feature-laden bed, the Silverado plays a strong game. 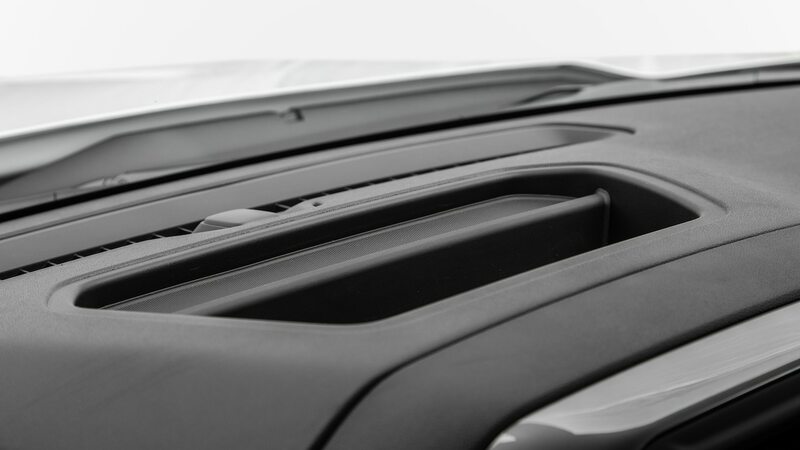 Its poor ride quality and seating position prevent it from reaching the top, though. 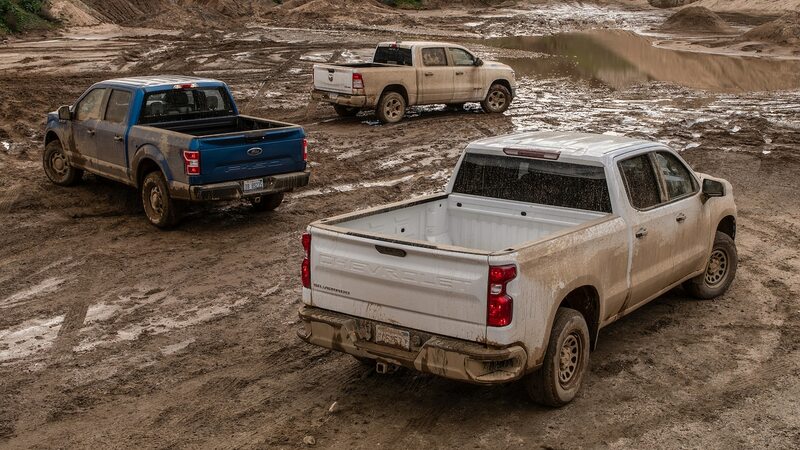 With the best ride quality and fuel economy, excellent utility, and a snappy interior for a base truck, our current Truck of the Year hauls home a bedload of gold medals. 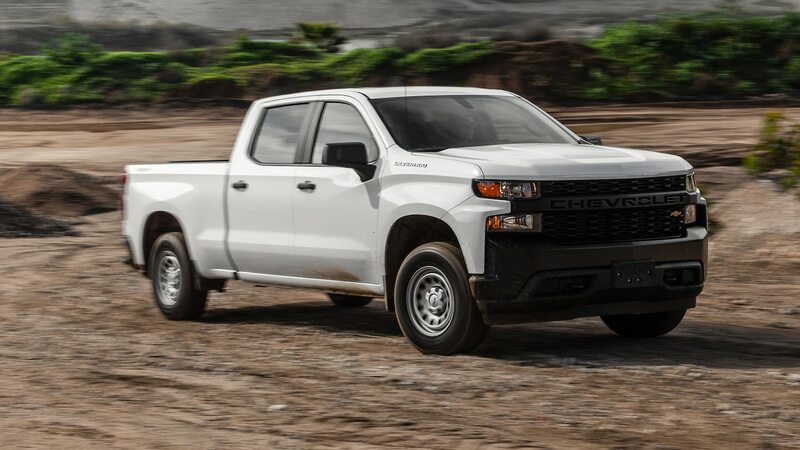 Its smart packaging and superior body control when towing or hauling heavy stuff make it the best half-ton work truck you can buy today. 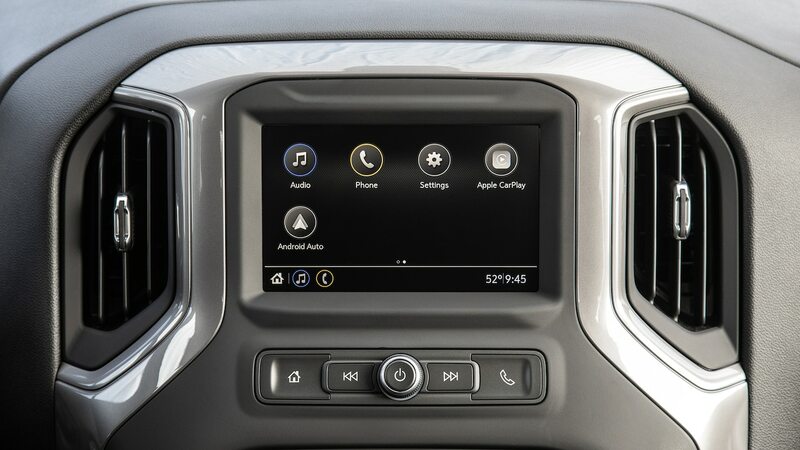 It does cost a bit more to get the features you want, but it’s worth it.